Transcript of the Michael Staker ICCF-21 video, taken from YouTube closed caption. The small type links are to the video, from the transcript times. I have not yet capitalized the first word of sentences. As usual with CFC documents, corrections are invited and much appreciated. 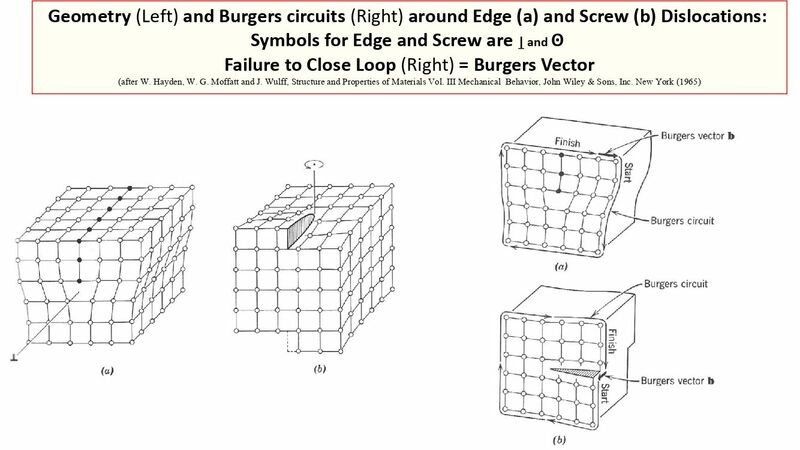 Slides have been added, taken from the slide pdf. Some slides were the same as the previous slide with new text or marks added. The earlier slides of these sequences have generally been left out as redundant for this format. All slides may also be seen in the video. (Though sometimes, Staker passed by them very quickly.) The abstract below is from the abstract pdf. 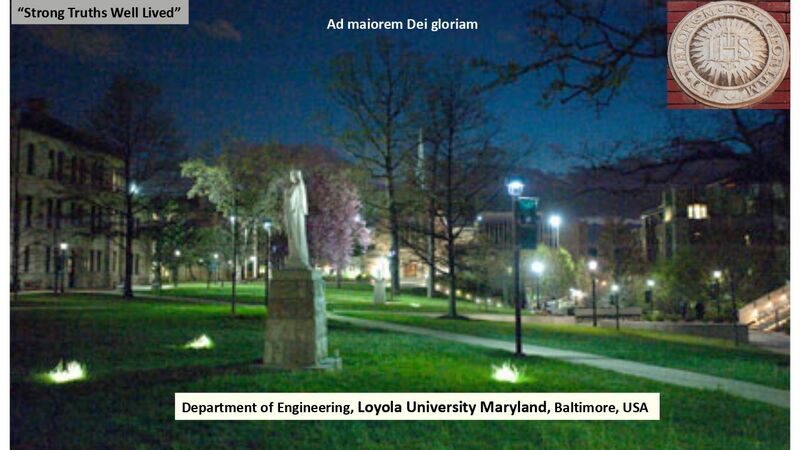 Department of Engineering, Loyola University Maryland, Baltimore 21210 U.S.A. 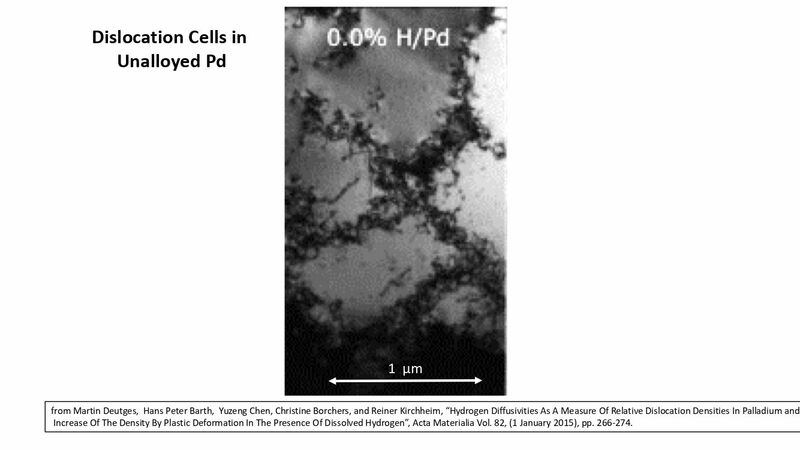 Results of a calorimetric study established the energy produced, over and above the input energy, from electrolytic loading of deuterium into Pd, was 150 MJ/cc of Pd (14000 eV/Pd atom) for a 46 day period. 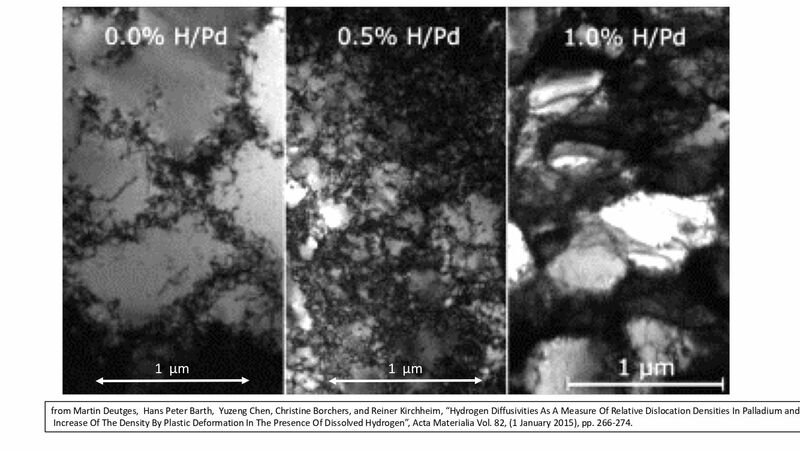 High fugacity of deuterium was developed in unalloyed palladium via electrolysis (0.5 molar electrolytic solution of lithium deteroxide, LiOD) and the use of an independent electromigration current. 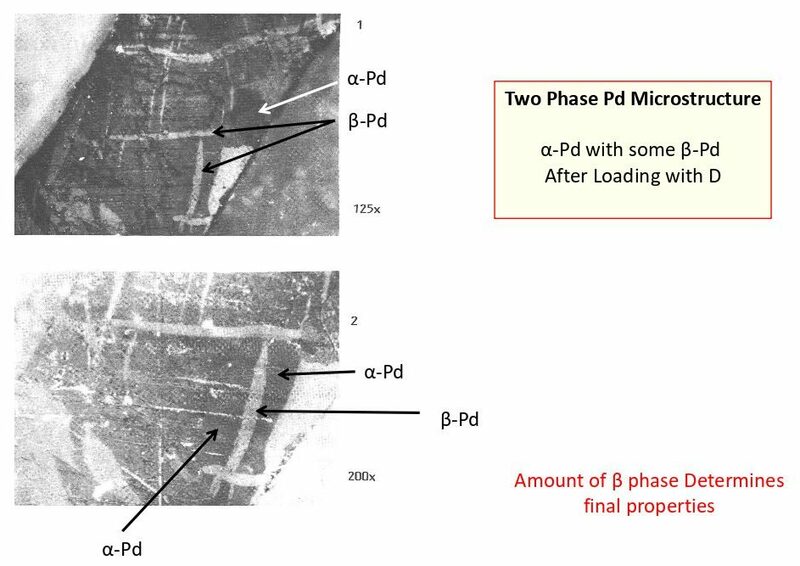 In situ resistivity measurements of the Pd were used to assay the activity of D in the Pd lattice (ratio of D/Pd) and employed as an indicator of phase changes. 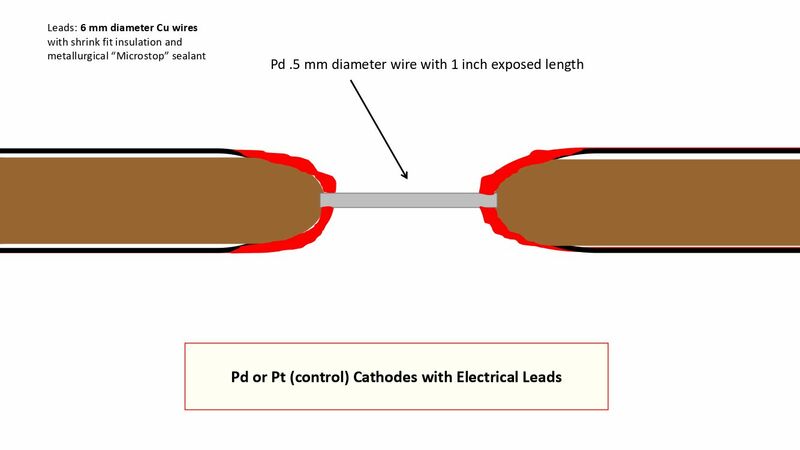 In addition, during this period, two run-away events were triggered by suddenly increasing the current density resulting in 100 percent excess power (2.4 watts output with only 1.2 watts input) necessitating a temporary cut back in the electrolysis current. 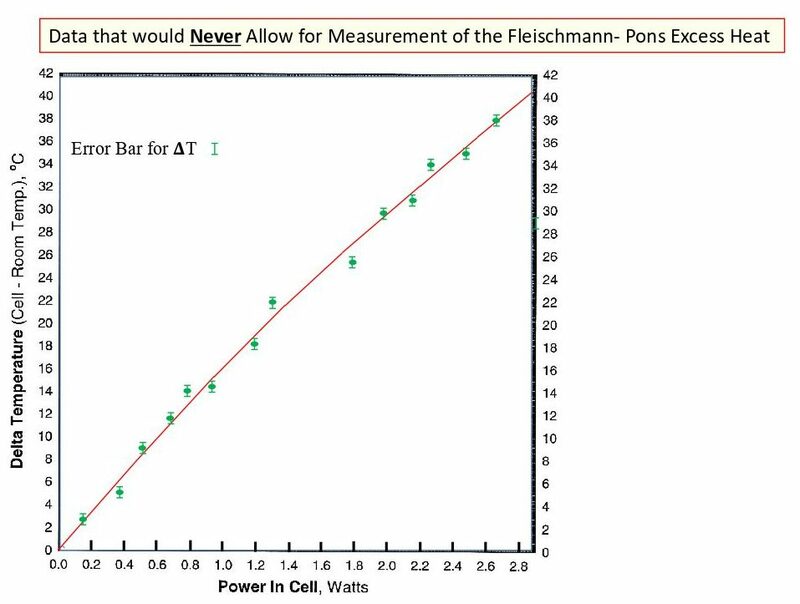 The average excess power (excluding run-away) ranged from 4.7 +/- 0.15 to 9.6 +/- 0.30 percent of input power while the input power ranged from 2.000 to 3.450 watts, confirming the Fleischmann-Pons effect. 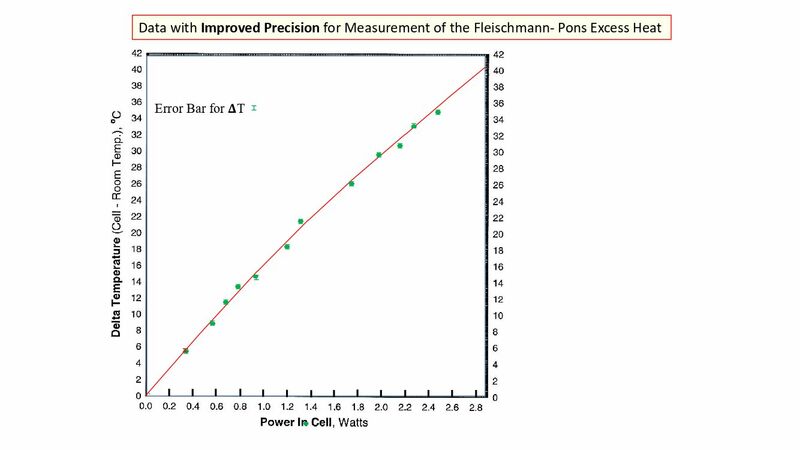 The precision was: Power In = +/-.0005 W; ∆T = +/- .05o C; Power Out = +/-.015 W giving an overall precision of +/- 0.5%. 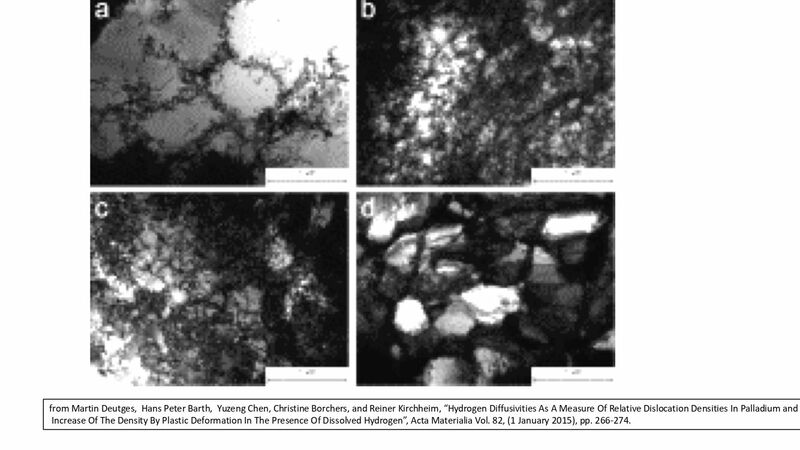 High fugacity was required to produce these results, and the triggered run-away events required even higher fugacity. 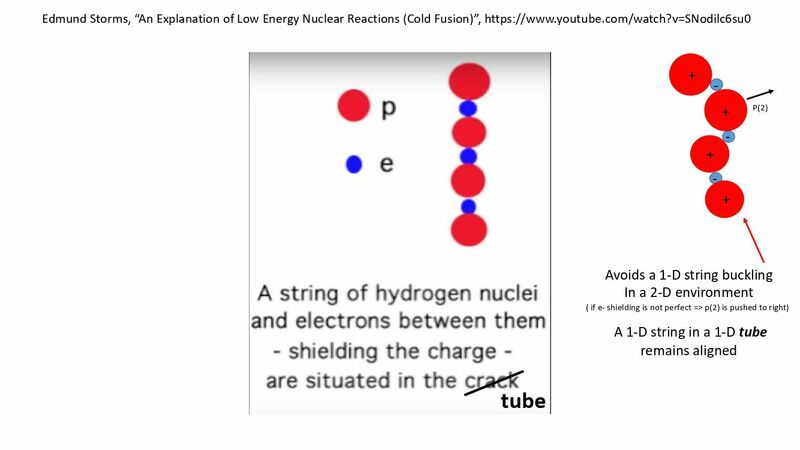 Using thermodynamic energy balance, it was found that the energy release was of such magnitude that the source of the energy is from a nuclear source, however the exact reaction was not determined in this work. 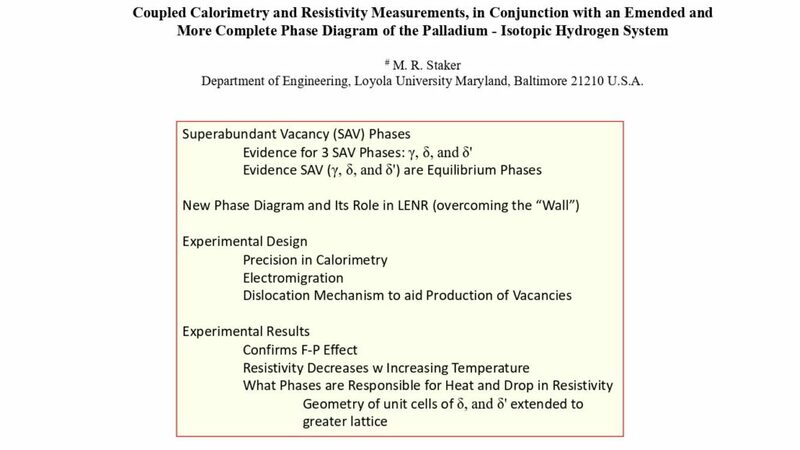 X-ray diffraction results from the recent literature, rules for phase diagram construction, and thermodynamic stability requirements necessitate revisions of the phase diagram, with the addition of three thermodynamically stable phases of the superabundant vacancy (SAV) type. 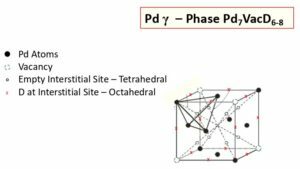 These stable phases, each requiring high fugacity, are: γ (Pd7VacD6-8), δ phase (Pd3VacD4 – octahedral), δ’ phase (Pd3VacD4 – tetrahedral). 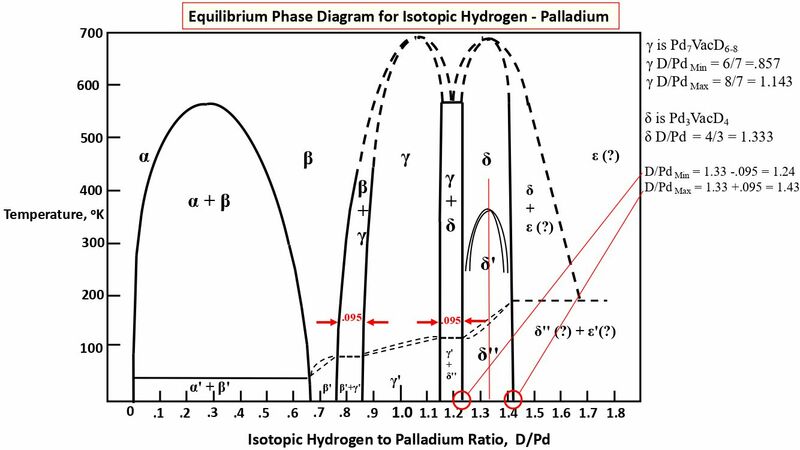 The emended Palladium – Isotopic Hydrogen phase diagram is presented here. 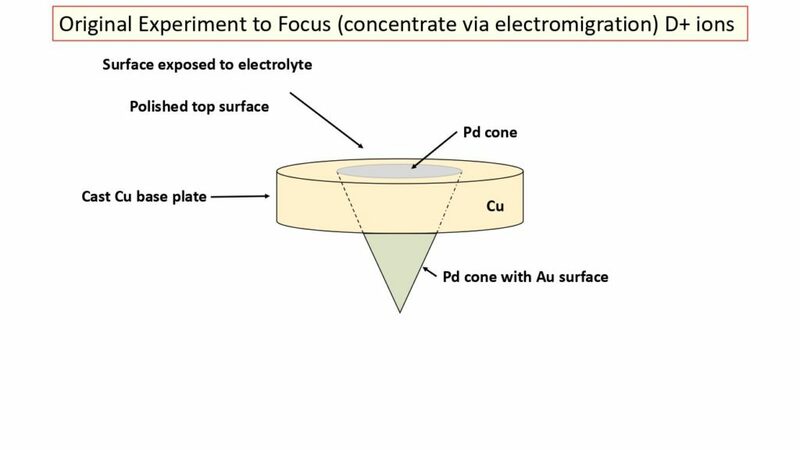 The excess heat condition supports portions of the cathode being in the ordered δ phase (Pd3VacD4 – octahedral), while the drop in resistance of the Pd cathode during increasing temperature and excess heat production strongly indicates portions of the cathode also transformed to the ordered δ’ phase (Pd3VacD4 – tetrahedral). 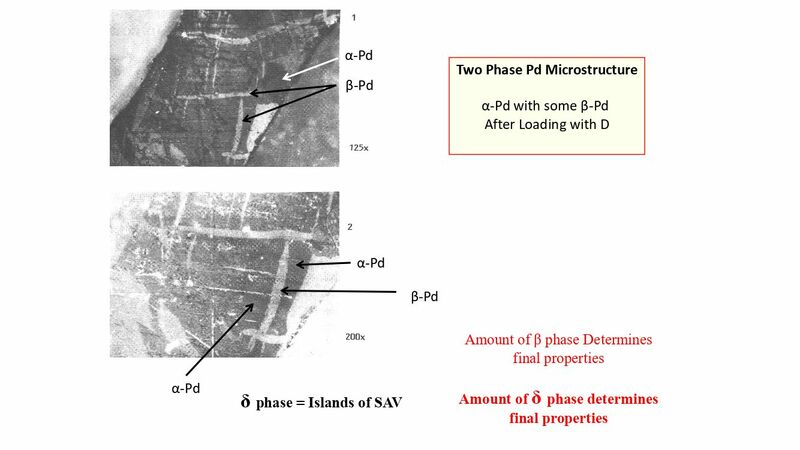 These phases were encouraged by the used of an electromigration current causing the D+ ions (trapped to vacancies) to pull the vacancies along and aid the formation of the SAV phases. 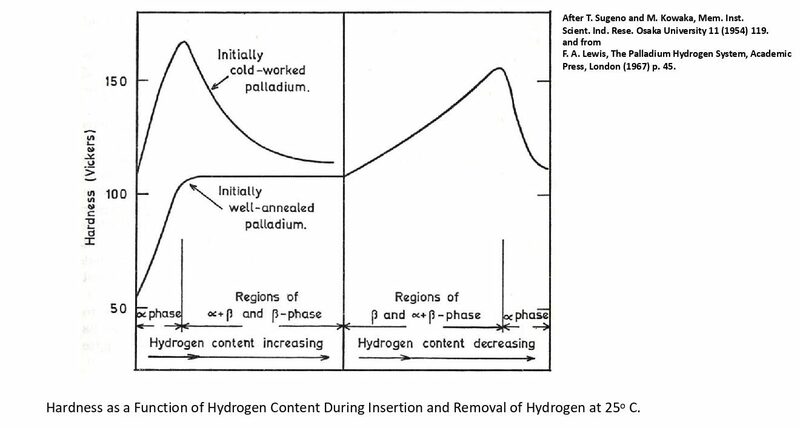 The heat increases with increasing volume fraction of the new phase. 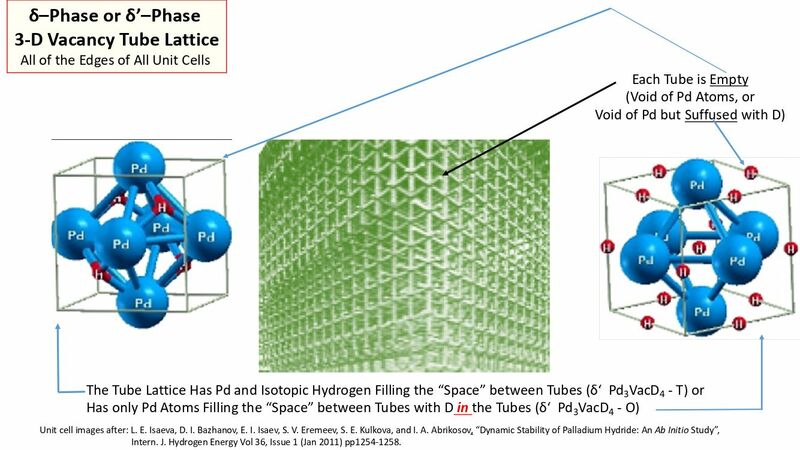 Extending these basic unit cells to the larger lattice epiphanates the nuclear active state as the δ and δ’ phases. 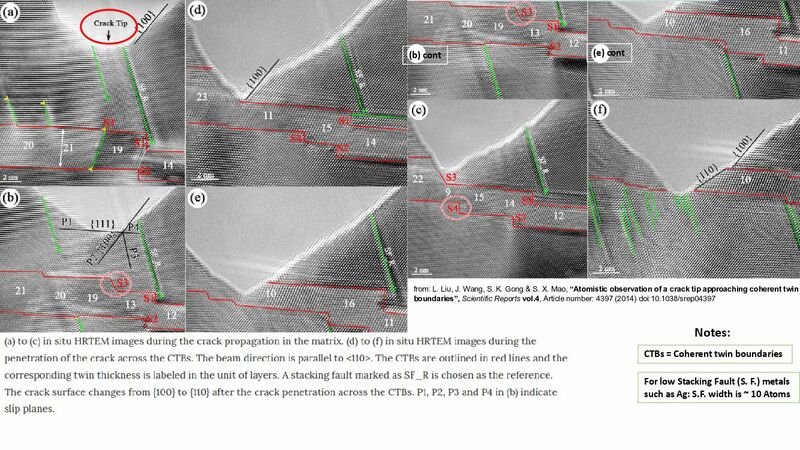 The decreased resistance phase, δ’, is modeled in the same way by extending the unit cell to the entire lattice revealing extensive pathways of low resistance. 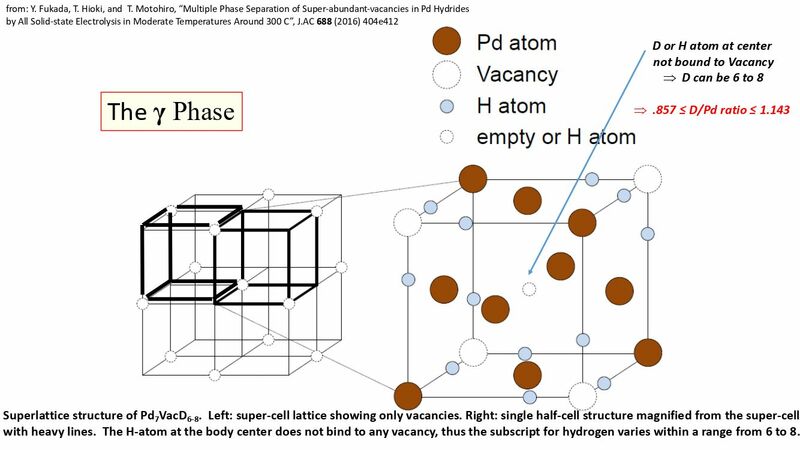 A potential connection of these phases to the superconductivity phase of PdH / PdD is offered. 00:00 anything that I skip will be in the 00:03 written report. so this is dedicated to 00:10 Joseph Ignatius and Martin. I’m gonna 00:18 have to skip two things that really 00:21 break my heart. 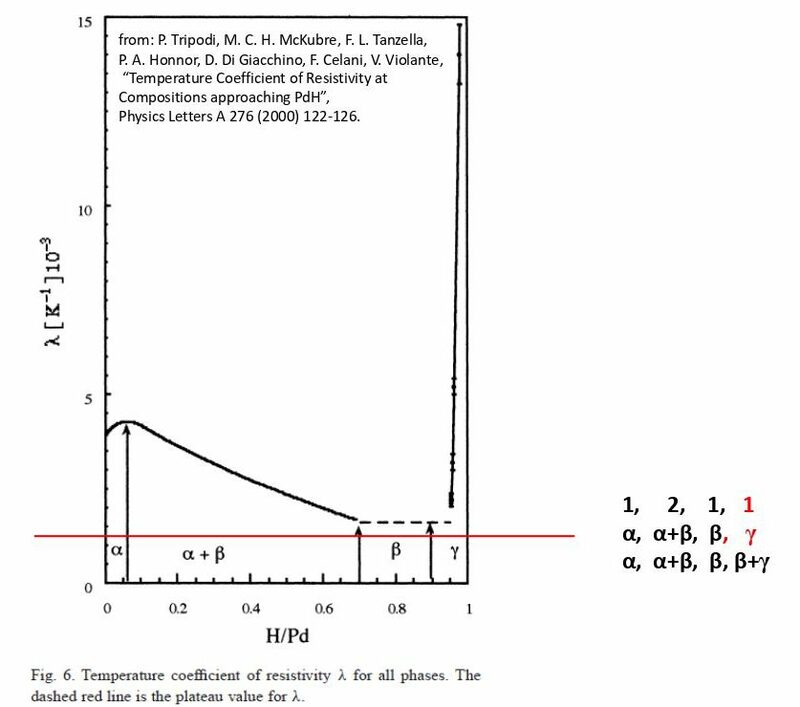 one is the the solid 00:25 experimental evidence for the presence 00:29 of the super abundant vacancy phases 00:32 gamma, delta, and delta prime, and also the 00:37 the other evidence that supports very 00:40 solidly that they are, in fact, the 00:42 equilibrium phases, that will be on the 00:47 phase diagram. 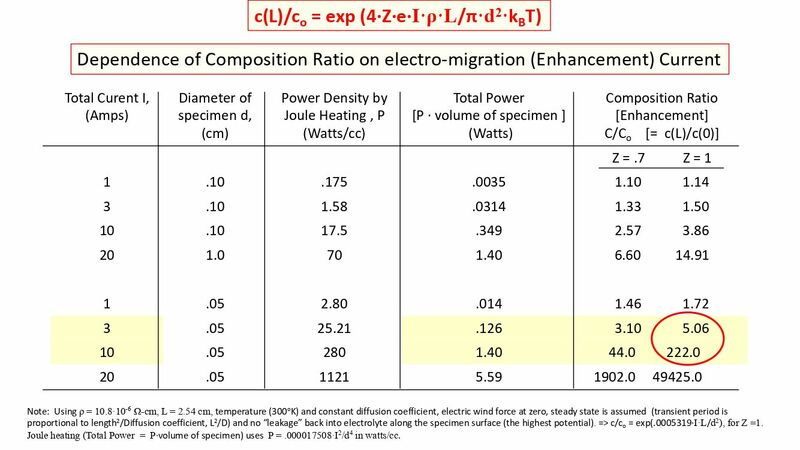 I’m also going to have to 00:52 skip the electro-migration theory, and I 00:56 will talk about the precision and the 00:59 calorimetry. 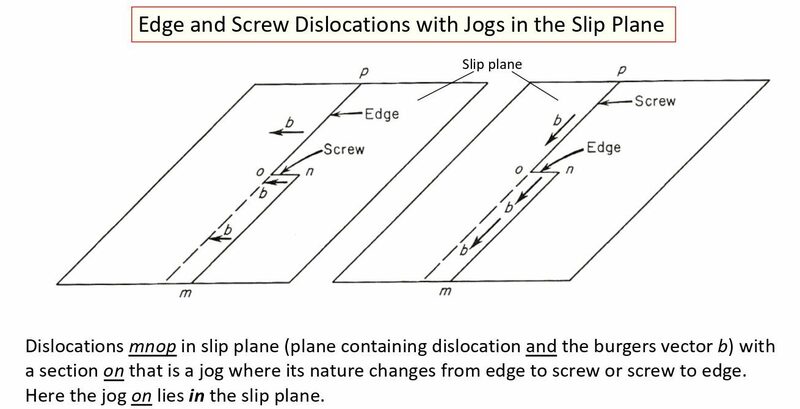 and I’m going to also have 01:01 to skip the theory on the dislocation 01:03 mechanism that produces a large amount 01:06 of vacancies. 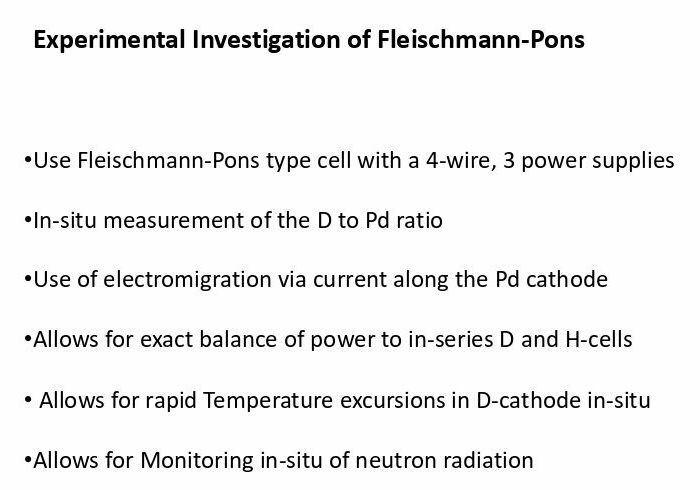 my experiments, I’ll talk 01:11 about the most, which includes the 01:14 confirmation of the Pons Fleischmann 01:16 effect, and my resistivity measurements 01:20 that decrease during increasing 01:23 temperature, and how this structure of 01:27 these new phases, from the phase diagram, 01:30 will impact low energy nuclear reactions. 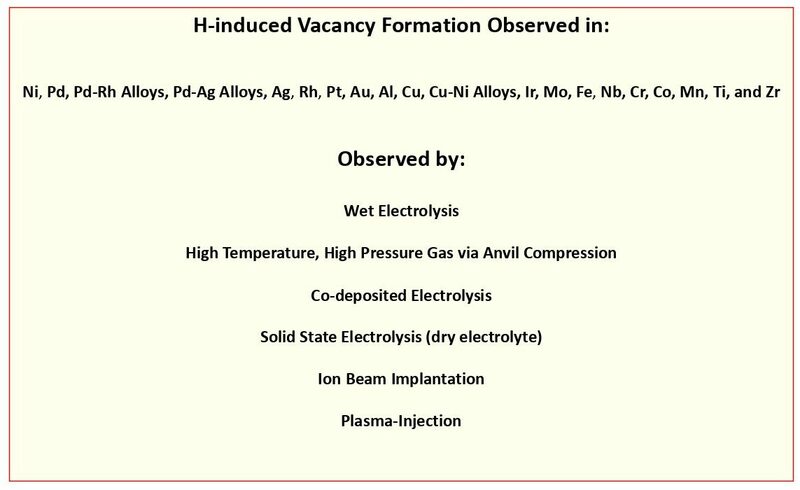 Slide 4 01:34 hydrogen induced vacancy, to very high 01:37 levels, has been observed in all of these 01:40 metals and alloys and all of these 01:44 techniques. I hope to add the New Mexico 01:48 technique as well soon. this, I am NOT 01:54 able to skip. in fact, I have to read it 01:57 to you line by line because I think it’s 02:00 very important. 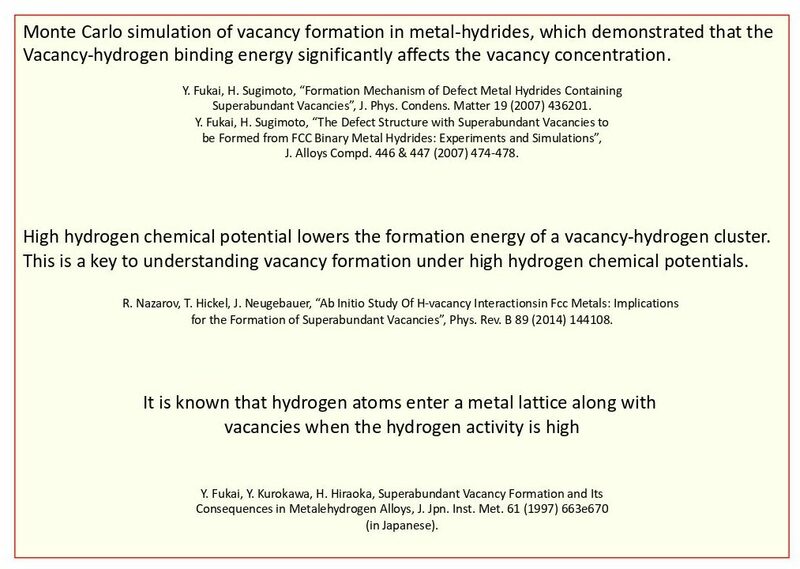 this is a quote from 02:02 Fukai’s book which says that most 02:05 important implication of the physics of 02:07 superabundant vacancies is that they’re 02:11 the most stable structure of 02:13 all metal hydrogen alloys is in fact 02:15 the defect structure containing a large 02:18 number of metal atom vacancies all metal 02:22 hydrogen alloys should tend to assume 02:25 such a defect structure, ordered or 02:27 disordered depending on the temperature, 02:28 as long as the kinetics allow, so the 02:32 thermodynamics is going to tell us they 02:34 should be there. whether we can get there 02:36 or not 02:36 is depending upon the kinetics. 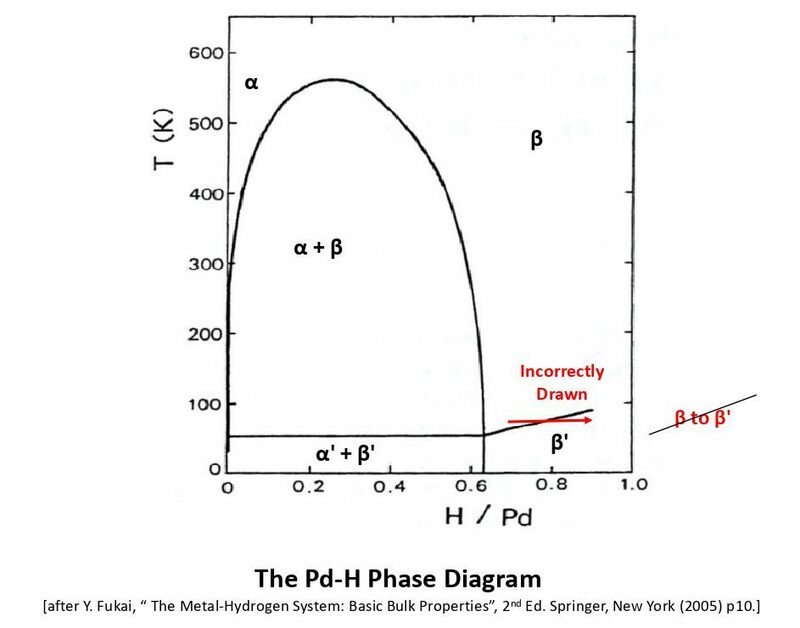 thus it can be said that looked at all 02:55 in fact phase diagrams of metal hydrogen 02:58 systems reported to date are metastable 03:02 ones. 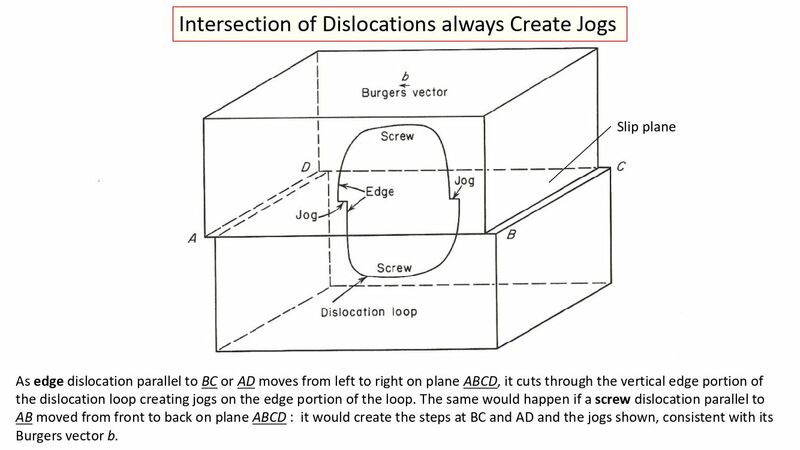 these metastable diagrams are 03:05 typically useful as such, but the 03:07 recognition that they are metastable 03:09 ones is of basic importance. 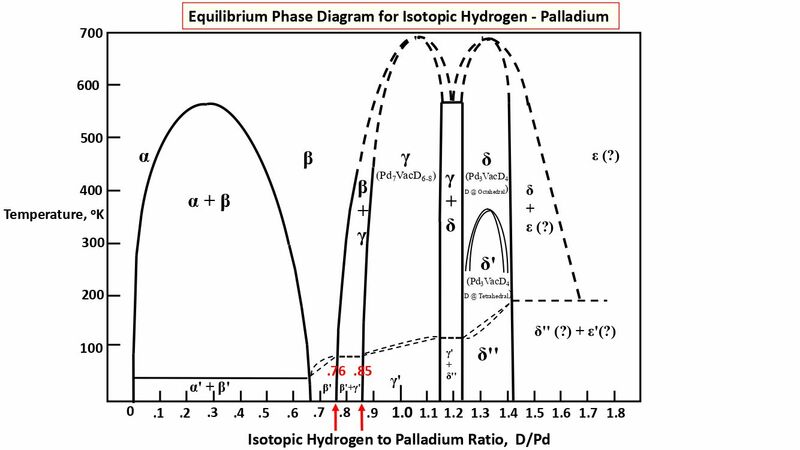 the real 03:11 equilibrium phase diagrams including 03:13 metal atom vacancies have not been 03:16 obtained so far. maybe so far, until 03:21 today. 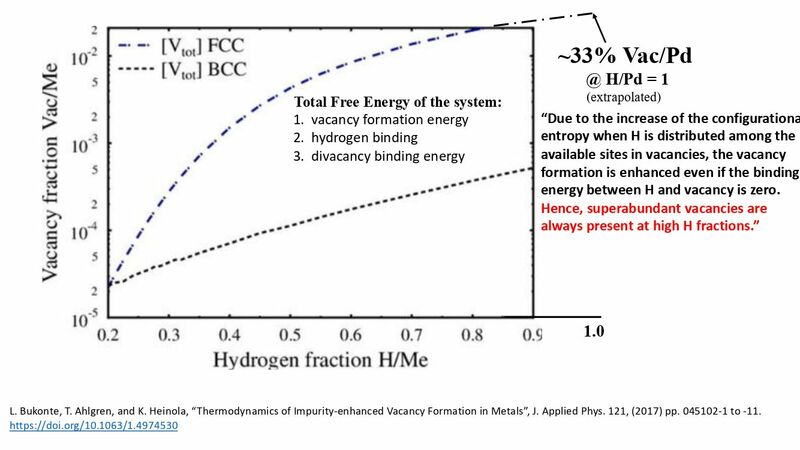 this is part of the evidence for the 03:30 presence of these superabundant 03:33 vacancies but the main point is that 03:35 regardless of how you prepare and how 03:37 you create them whether by high pressure, 03:40 high temperature, or a co-deposit, you 03:43 have the same thermal desorption. 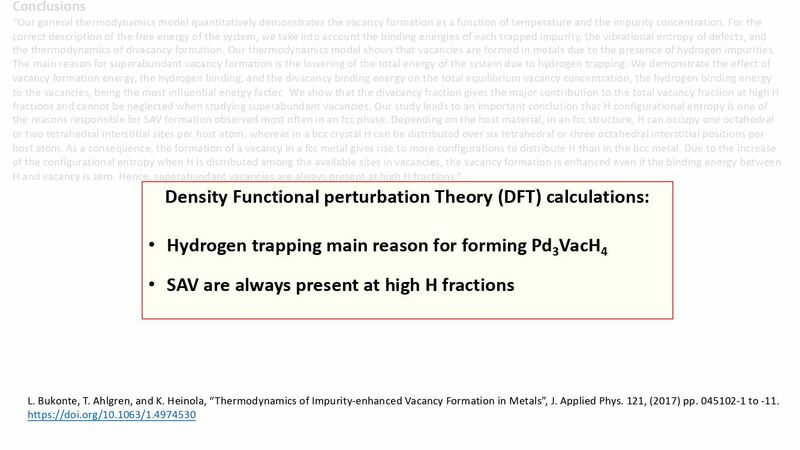 and some of the other 03:58 supporting papers which report their 04:03 findings in terms of calculations that 04:05 these super abundant vacancies are in 04:07 fact the most stable, the true 04:10 equilibrium form of the alloy. this was a 04:15 calculation done prior to the x-ray 04:18 diffraction detection. 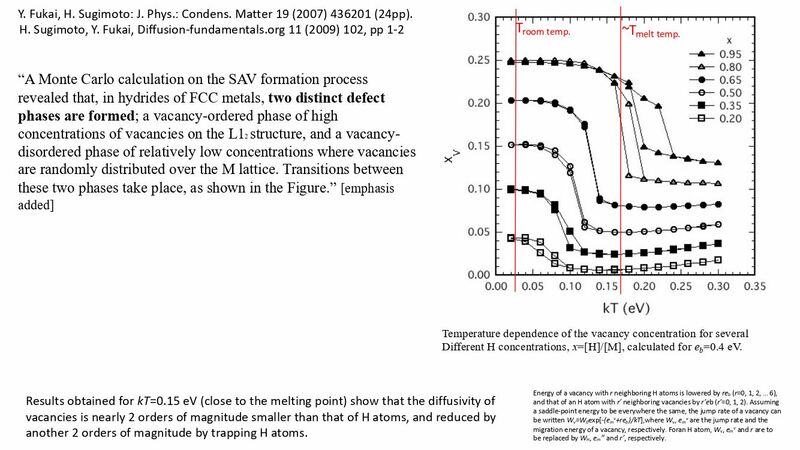 this was in 2007 04:21 and a 2017 paper reported the finding 04:27 that was found in this particular 04:29 calculation where there were two forms of 04:32 the super abundant vacancies, one with a 04:33 higher concentration of vacancies than 04:36 the other one. and the 05:15 structure that we’re talking about is 05:17 shown on the right here. 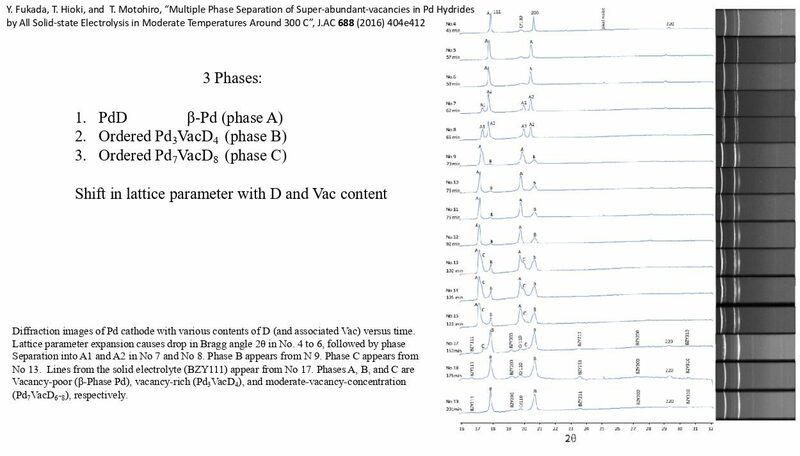 the super 05:20 abundant vacancy form is an ordered 05:22 lattice of the Pd3Vacancy1D4 05:26 composition. 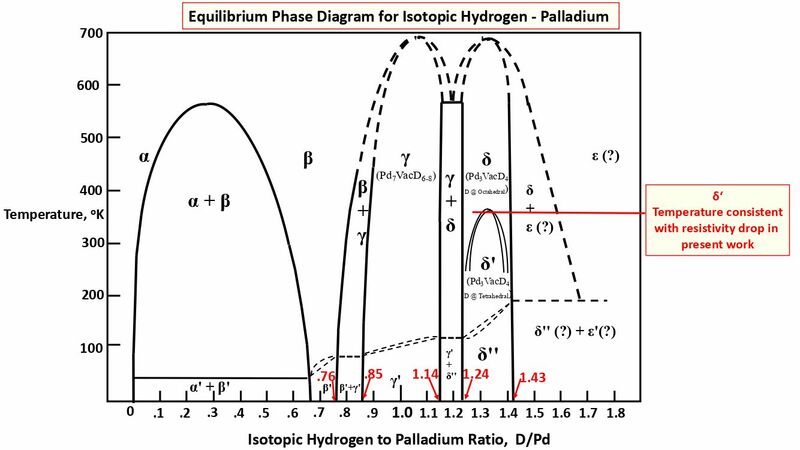 it’s a compound that 05:30 has that stoichiometric distribution, and 05:34 what we’re really talking about here is 05:36 that all the corner atoms are missing, in 05:38 this face centered cubic 05:40 palladium cell . so that’s one out of 05:43 every four atoms in this unit cell 05:46 are gone. 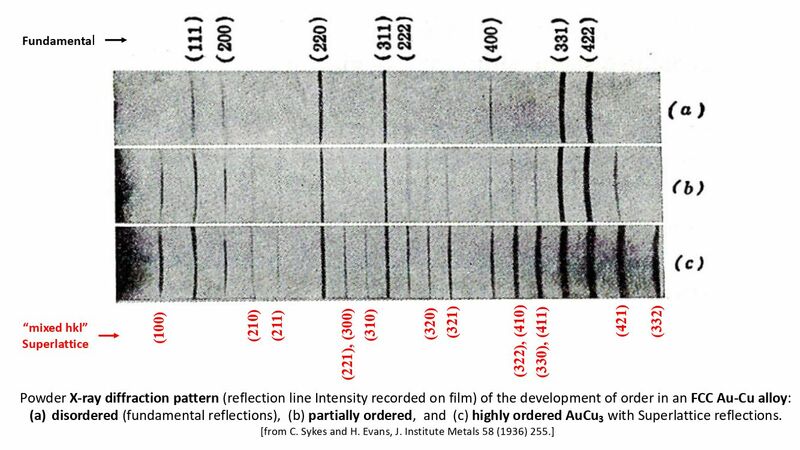 this is the x-ray 05:56 diffraction proving that there is in 05:58 fact that structure. this is more. 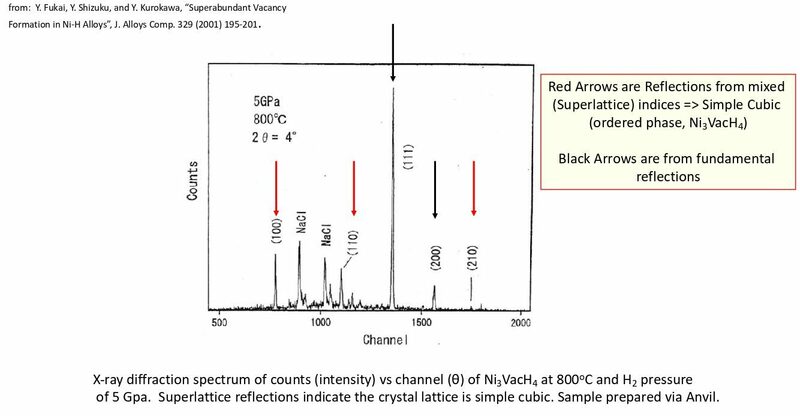 this 06:01 happens to be for nickel that takes on 06:03 the same ordered phase Ni3VacH4 06:07 .
this was the most 06:12 recent experimental evidence that there 06:15 are two forms of this super abundant 06:19 vacancy: form one with a Pd3Vac4 [sic, Pd3VacD4] 06:21 structure, and one with the Pd7Vac8 [sic, Pd7VacD8] 06:24 structure. again I have to fast 06:30 forward here.
. . . the theoretical density 06:33 function perturbation calculations 06:37 that show this structure to be the most 06:40 stable, and that there’s in fact a 06:42 bonding or trapping between the hydrogen 06:45 and the vacancy, and that super abundant 06:47 vacancies are always present at high 06:49 hydrogen fractions. that’s what the 06:53 calculations show. that’s what the 06:54 thermodynamics show. whether the kinetics 06:56 are going to be in favor is another 06:58 issue. I’m going to skip this. 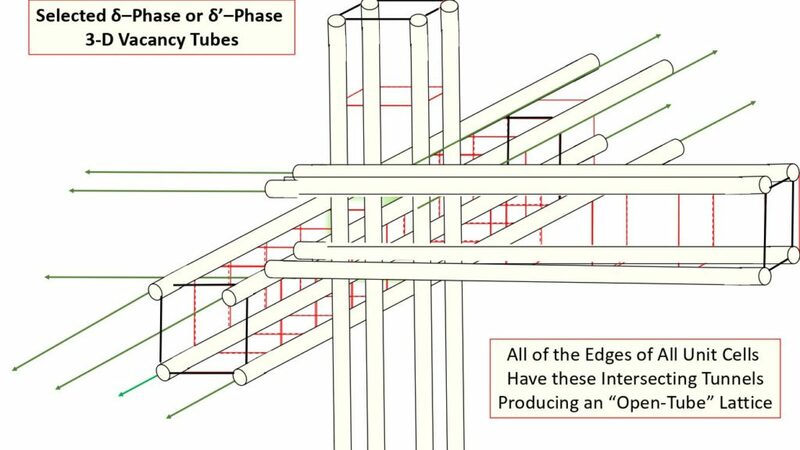 this is 07:02 more papers confirming this, the basis of 07:07 the fact that the structure is the most 07:11 stable, lowest free energy form, of the 07:14 structure. 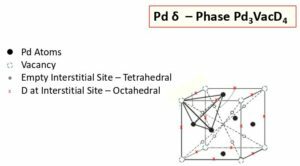 this is the Pd7 07:18 Vacancy D6 or D7 or D8 07:25 stoichiometry structure, and the unit cell on 07:29 the right is inadequate to fully contain 07:33 the symmetry. you need two cells because, 07:37 instead of having all the corner 07:40 atoms vacant, only half of them are 07:43 vacant. 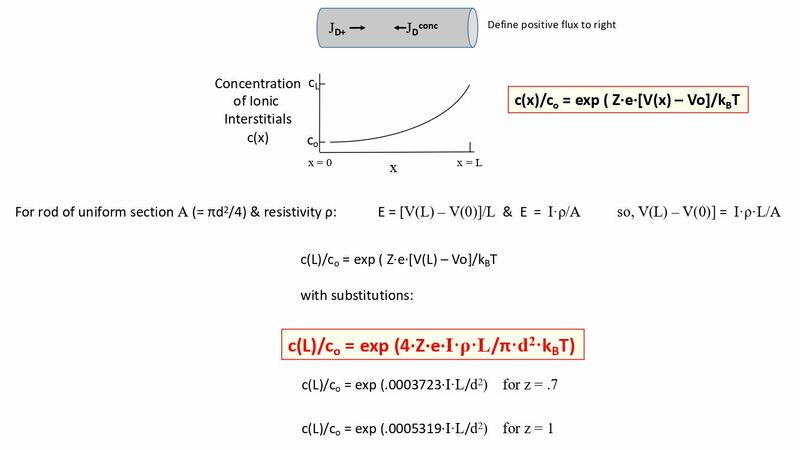 so you need two of these to 07:48 complement, to make a unit cell. 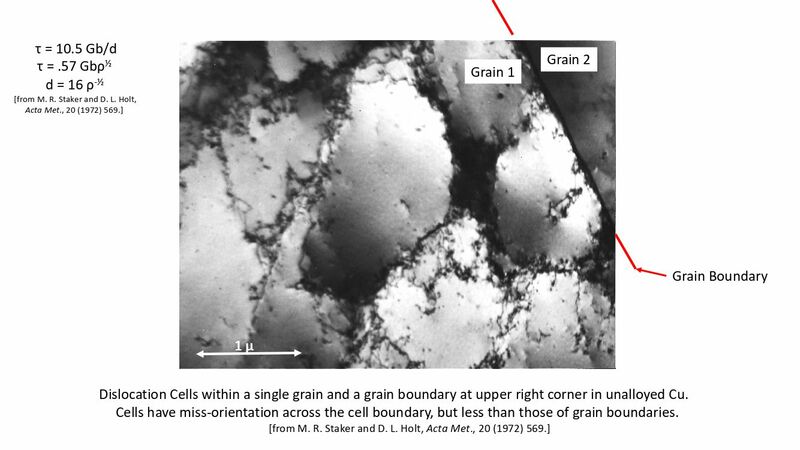 there’s that trapping bond in there that 08:15 is not present in the octahedral site in 08:19 the center of the cell. 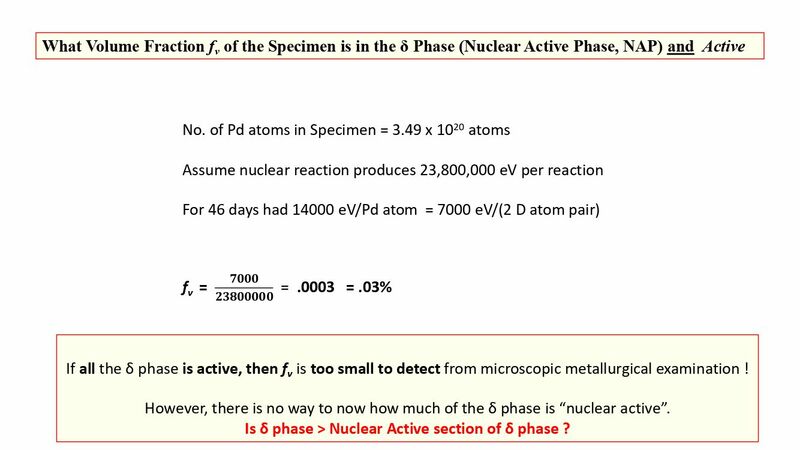 so whether this 08:23 atom or site is filled with a hydrogen, 08:25 or whether it’s empty, or whether the 08:30 other twin component is filled or empty 08:34 will give you a range of 6 to 8 on 08:38 the stoichiometry. 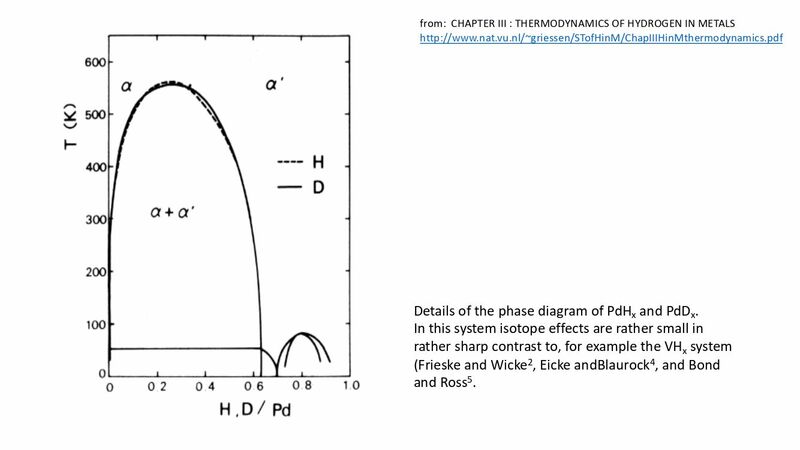 so that’s going to be a range on the 08:53 phase diagram for the gamma phase. you end up with a 09:14 dislocation structure that’s very much 09:17 like that plastically deformed or cold 09:19 worked prior to initiating. 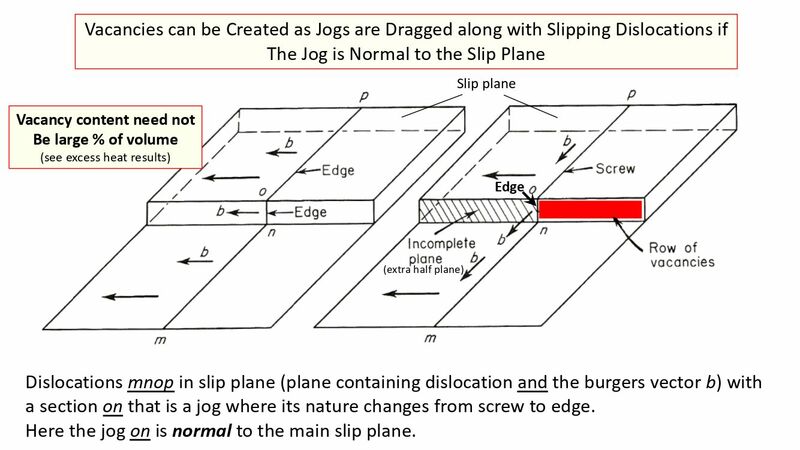 it leaves 09:37 a row of vacancies as the dislocation 09:45 moves and plastic deformation is the 09:48 motion of dislocation, so dislocations 09:50 are present in millions of millions, 10 09:53 to the 12th per cubic centimeter, and 09:57 that vacancy concentration would not be 10:03 — or this mechanism would not be enough — to 10:07 fulfill the entire bulk producing one 10:12 out of four vacant sites. however as 10:15 you’ll see at the end of this 10:16 experimental method that the — and this 10:19 this has also been calculated by others 10:21 — the volume percent of the nuclear 10:24 active area is very low. 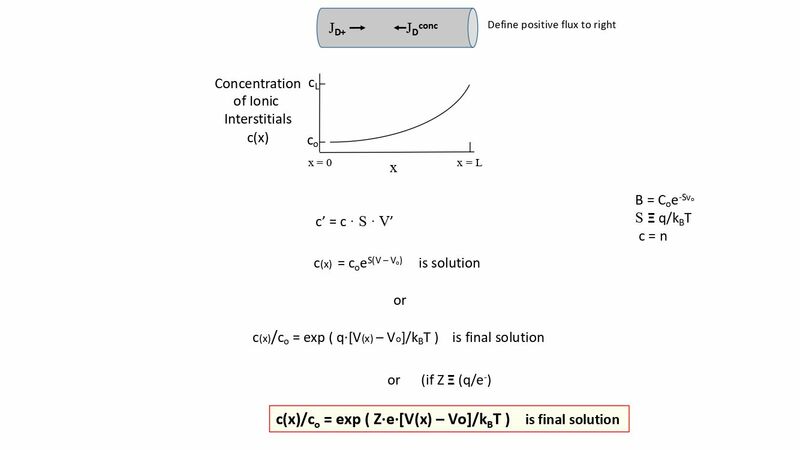 so this 10:27 mechanism would would be adequate to 10:29 supply the the volume needed. 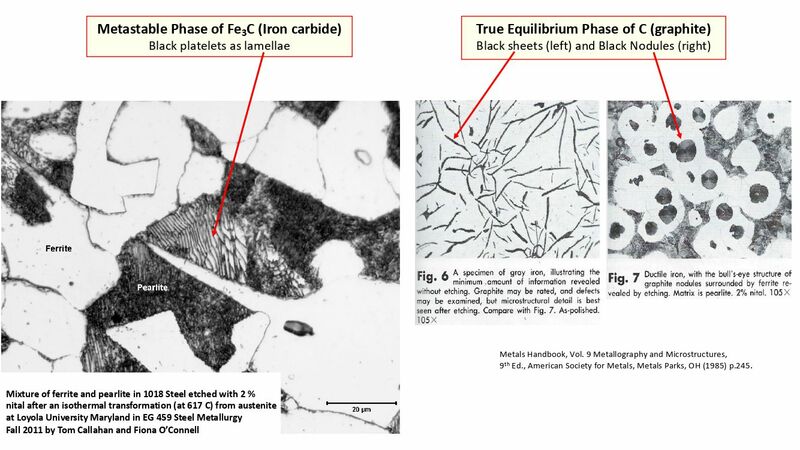 these are 10:34 the dislocation structures, the black 10:36 lines, and in unalloyed palladium that 10:40 forms cells, as it does in all the other 10:42 FCC structures, and in the hydrides 10:45 themselves. these dislocation densities 10:47 are very high as well. 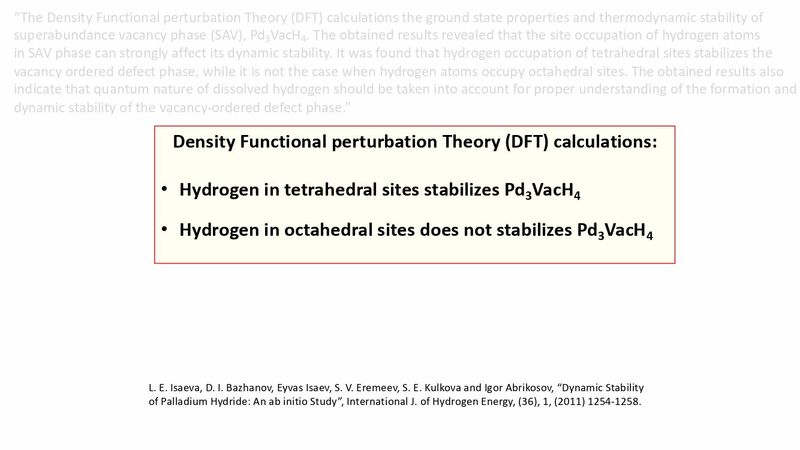 then when the 10:53 this equilibrium structure, Pd3 10:58 vacancy D4 is formed and you 11:02 subject it to vacuum, and 11:04 heat it and degas it, now you don’t have the 11:07 hydrogen in there to support the vacancy. 11:10 so you’re at a different location on the 11:13 phase diagram you’re back to the meta 11:14 stable condition. and so those vacancies 11:17 can conglomerate and together lower 11:21 their energy slightly by doing so, and 11:23 form pores. 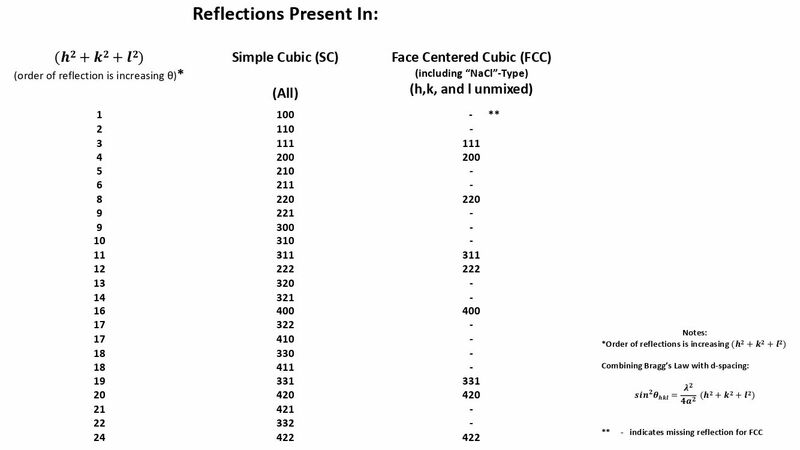 but this is a very high 11:29 pore concentration or a volume fraction 11:32 of pores. 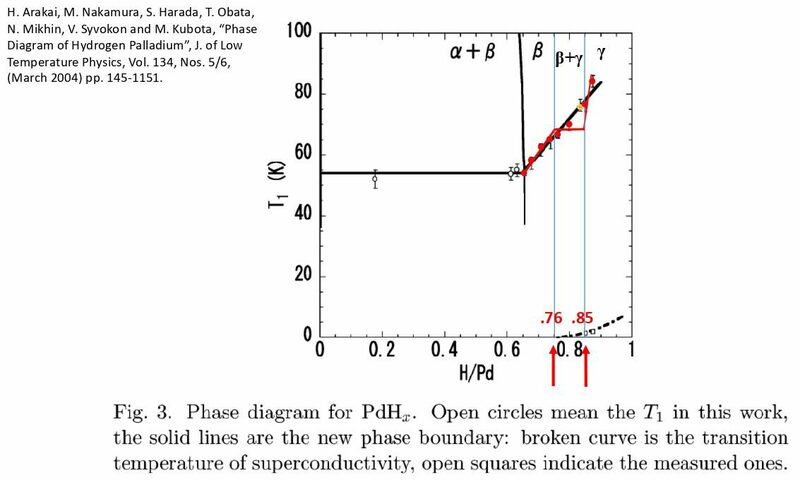 and the issue 11:51 of metastable versus equilibrium phase 11:54 diagrams is also unfortunately something 11:57 I’m going to have to pass through. 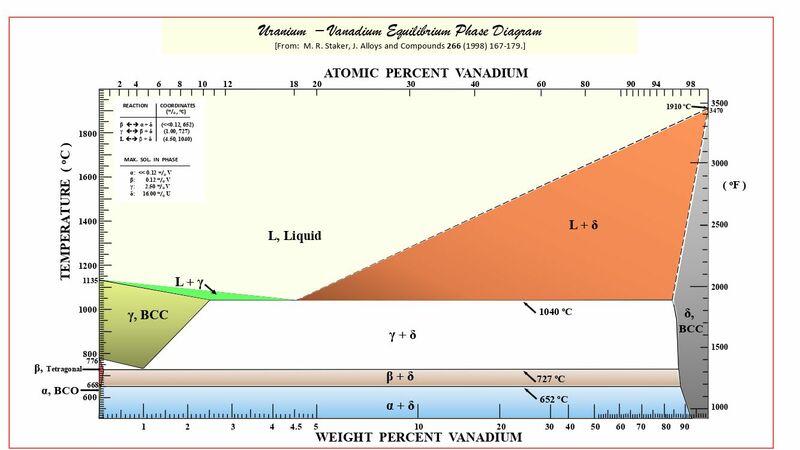 so the 12:01 equilibrium is thermodynamically the 12:04 most stable diagram, has the lowest free 12:06 energy. 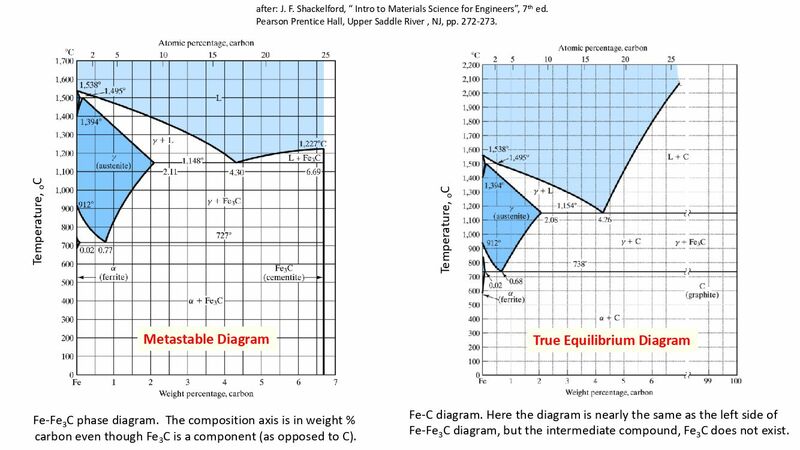 this is two diagrams, one 12:10 metastable, one the true equilibrium for 12:14 iron. 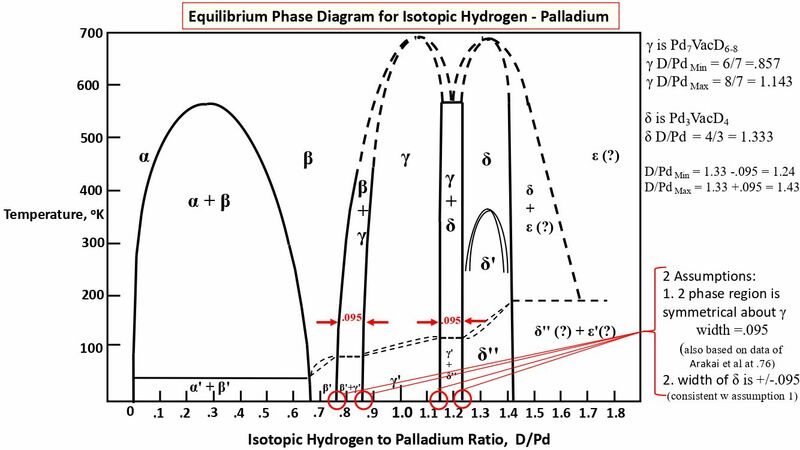 this is the same thing shown in two 12:16 separate diagrams, but there’s a 12:18 metastable diagram [and] an equilibrium 12:20 diagram. 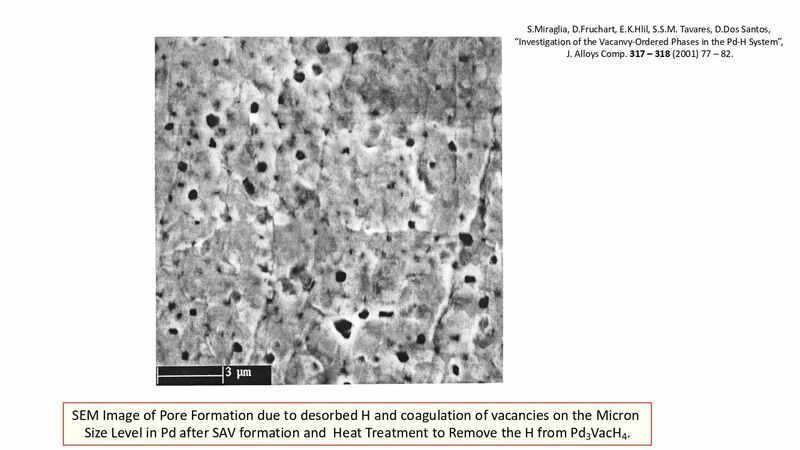 both are useful in fact we use 12:23 that to heat treat alloys. 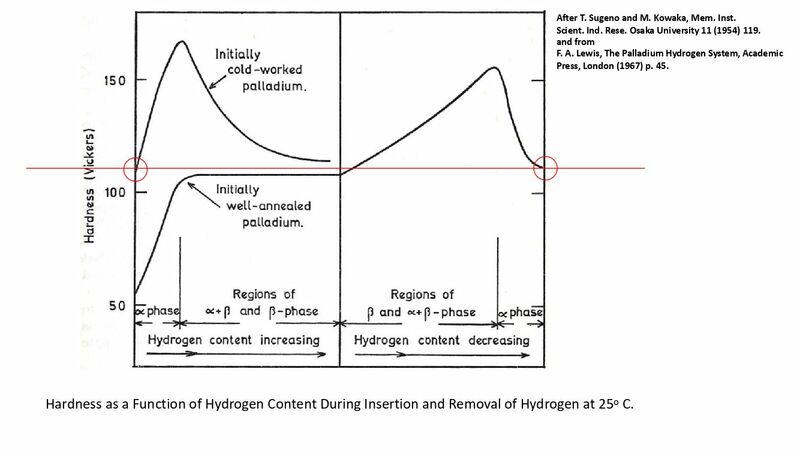 and I’m gonna 12:27 skip this example with uranium , but 12:29 basically it’s demonstrating the phase 12:32 sequence, which is a necessary condition, 12:34 that you alternate between one and two 12:37 phases as you go along an isotherm. 12:49 in the palladium hydrogen system, there 12:52 has not been, at least to date, much 12:55 evidence to support much of a difference 12:58 between the isotopes, so I’ve taken the 13:01 liberty of just dealing with them being 13:04 the same in the phase diagram. 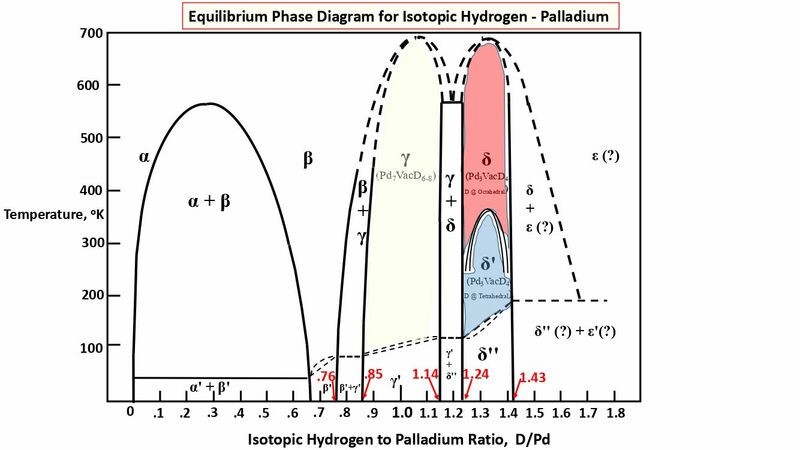 this is a 13:07 phase diagram probably the best, that 13:10 metastable one, that we have to date but 13:13 what you notice in a minute is that all 13:17 the equilibrium structures on the right 13:19 are missing. because this is a metastable 13:22 diagram, with a minor mistake. I’m gonna 13:29 have to also . . . I was going to use this to 13:32 show where I got the calculations, and 13:35 support some of the numbers on my phase 13:37 diagram, but I’m gonna just pass through 13:40 this. 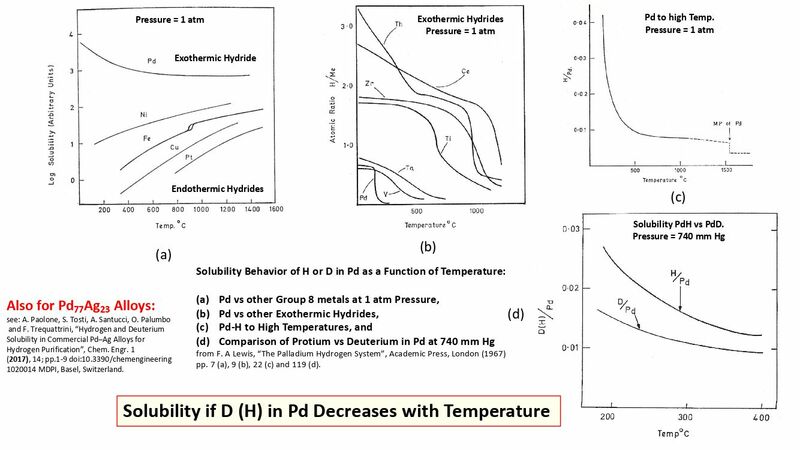 again, attention to detail as 13:45 you’re drawing the phase diagram make[s] a 13:46 big difference. This is the 13:49 equilibrium phase diagram, then, for the 13:52 palladium isotope of hydrogen system. 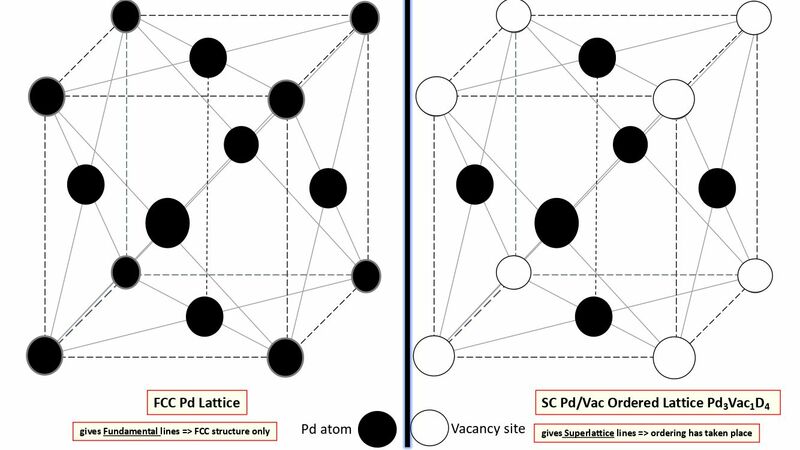 but notice 14:04 that there’s the beta phase which we’re 14:07 all familiar with, the gamma phase which 14:08 was the lower vacancy concentration ,the 14:11 Pd7VacD6-8, and then the 14:15 delta phase, which was actually 14:18 discovered before the gamma phase, which 14:20 is a Pd3VacD4 and its 14:23 location. but the most 14:53 important thing is that I have 14:56 experimental evidence that supports this 14:59 delta to delta prime 15:02 transition. 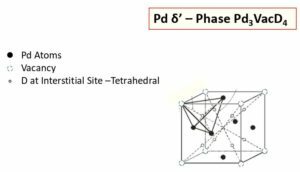 and basically the difference 15:04 between delta and delta prime is the 15:06 location where the deuterium 15:08 finds its home, whether it’s at the 15:11 octahedral site, as a delta phase, or as a 15:14 tetrahedral site as a delta prime phase. 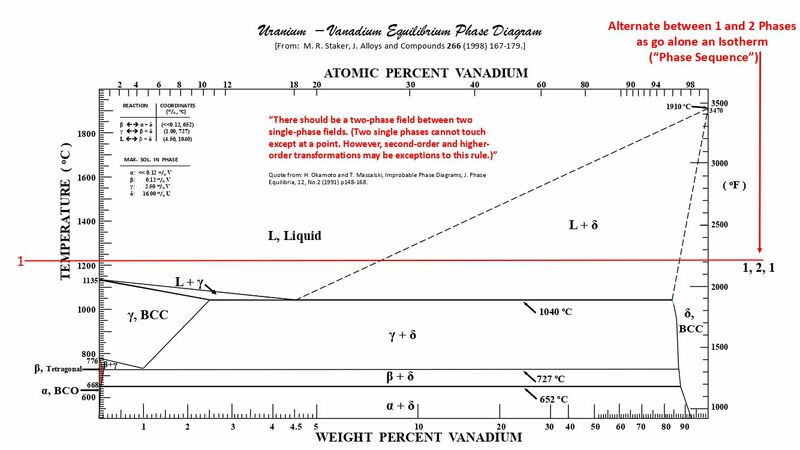 15:23 but bottom line is that the yellow and the red 15:26 and the blue are the two most important 15:28 additions to the phase diagram. they are 15:30 the equilibrium conditions. they’re the 15:34 true, lowest free energy forms, and the 15:38 problem is whether or not kinetically 15:40 you can get there. 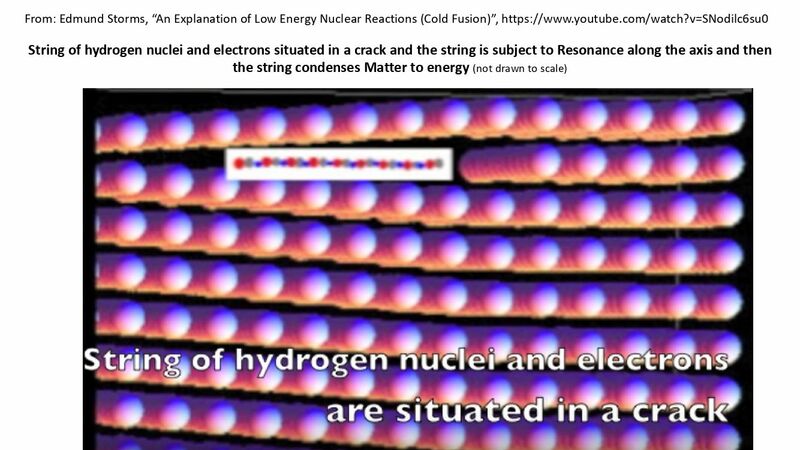 I think that’s one 15:45 of the the issues that’s been troubling 15:48 LENR. I might just add that this right 15:54 area over in this area is still under a 16:00 lot of speculation, but there’s at least 16:02 some support in Tripodi’s work to 16:10 indicate it happens at 1.6.
but this was my first 16:26 attempt, which I’m going to skip, at using 16:29 electromigration. 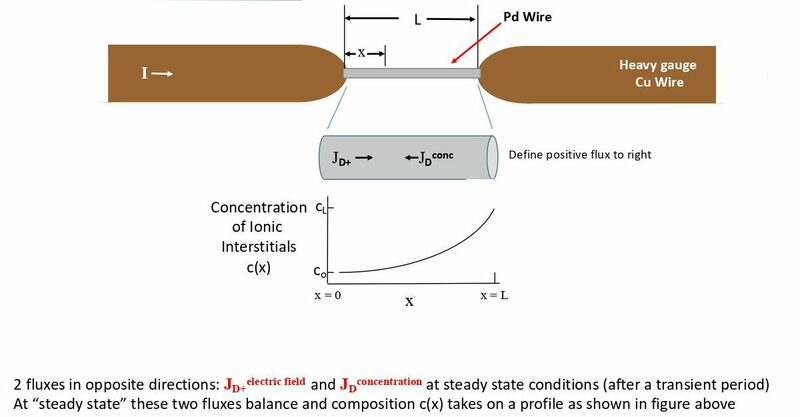 the second attempt to 16:32 use electro migration is a very small 16:34 specimen, [a] right circular cylinder, that’s 16:38 connected between two heavy gauge copper 16:41 wires, and the point is that if you pass 16:46 a current through, you can get a 16:47 concentration gradient due to the 16:49 electromigration 16:51 flux, due to the electric field, and 16:54 the back flux, due to fixed diffusion, 16:58 and when these two balance, of course, you 17:01 get steady-state, and then if you solve 17:03 that differential equation, you will get 17:05 the solution, using the boundary 17:08 conditions, which, the solution, looks like 17:09 this. 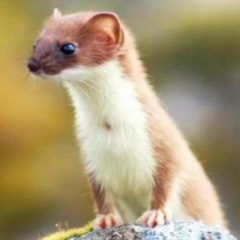 replacing the voltage with 17:11 current, you get the final solution, and 17:13 plugging in the cross-sectional area 17:15 as a diameter, you get this solution. 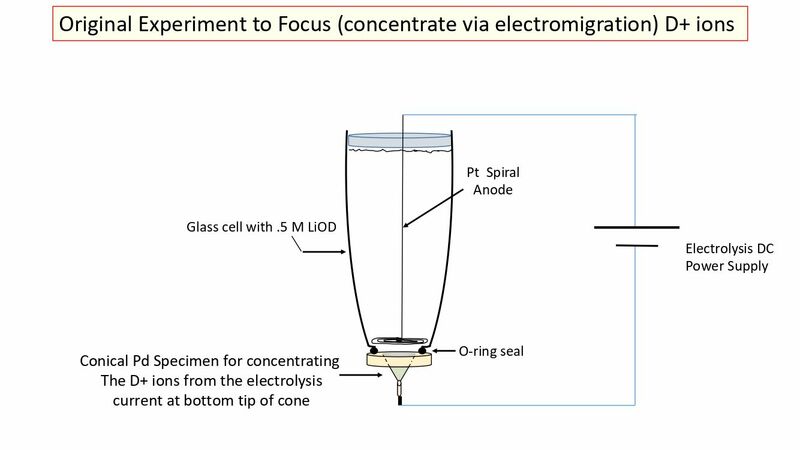 17:20 this is a ratio of the concentration at the 17:24 far end as a function of the 17:28 other end of the specimen. the bottom 17:31 line is that there’s a substantial 17:33 contribution enhancement. if this 17:38 enhancement were only 0.3 or 0.4, I’d 17:43 consider it a successful mechanism but 17:47 it’s much more than that. 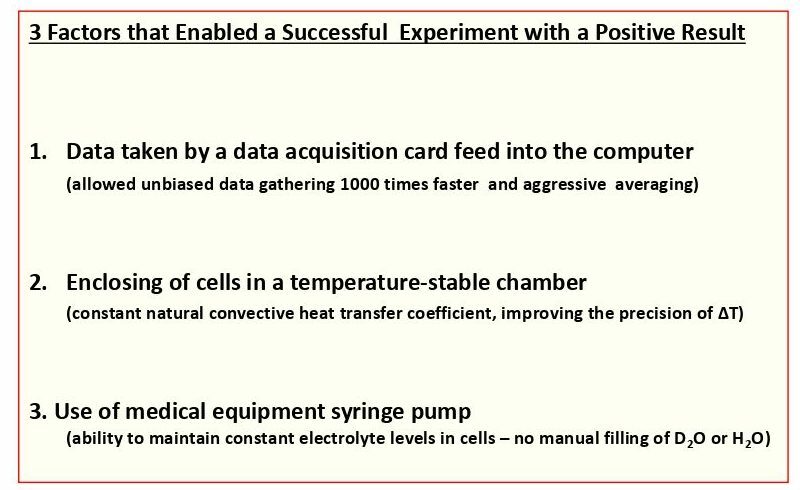 17:49 typically, in my experiments, I ran 17:53 around 3 amps continuous, and 17:56 electromigration current which only 17:59 added about a tenth of a watt to the 18:02 system, but on some occasions, I went 18:05 as high as 10 amps for electromigration 18:08 and that still only added one, 18:10 one-and-a-half amps [sic, watts] to 18:14 the cell. however, my sample is very small, 18:19 so I wanted to keep this down to as low 18:22 as possible. this is the diagram but 18:26 that’s shown here 18:27 with twin cells one heavy, one light [water], run 18:31 in series. 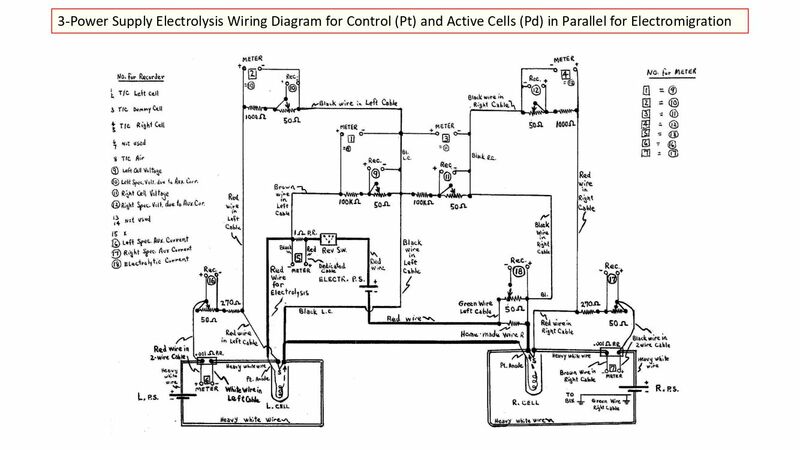 3 power sources, one to run the 18:34 electrolysis, and one dedicated for each 18:37 of the cells to run the electromigration. 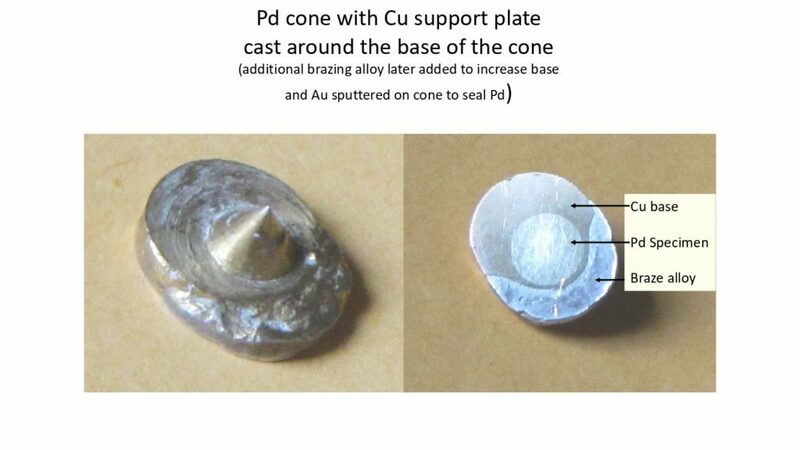 and 18:51 then the specimen was inserted into 18:53 molten copper prepared that way. 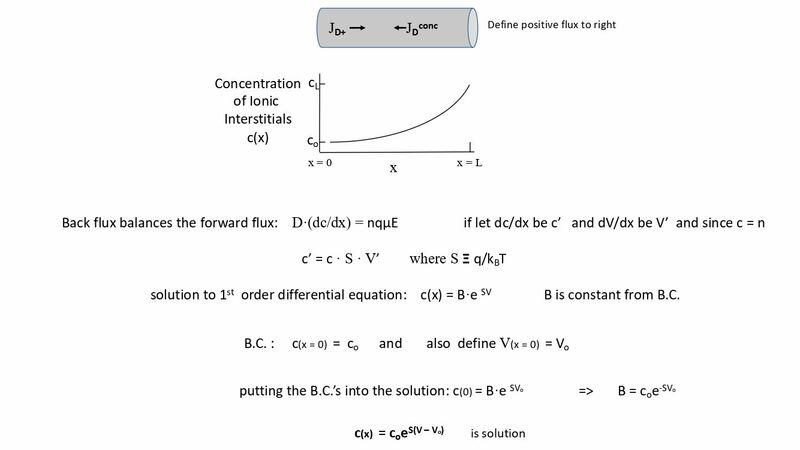 to get 18:57 good calorimetery, I thought that you 19:01 would need high thermal diffusivity in 19:04 the calorimeter media. that’s outside the 19:06 cell. 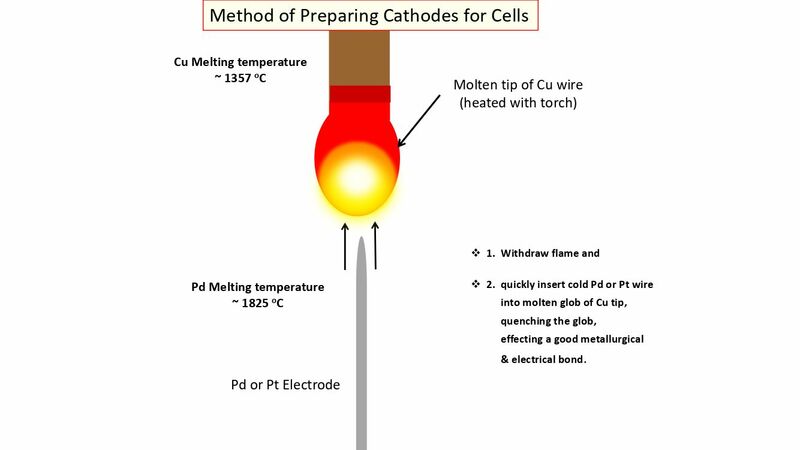 you need high heat capacity of the 19:10 calorimetry, but not of the cell 19:13 itself. 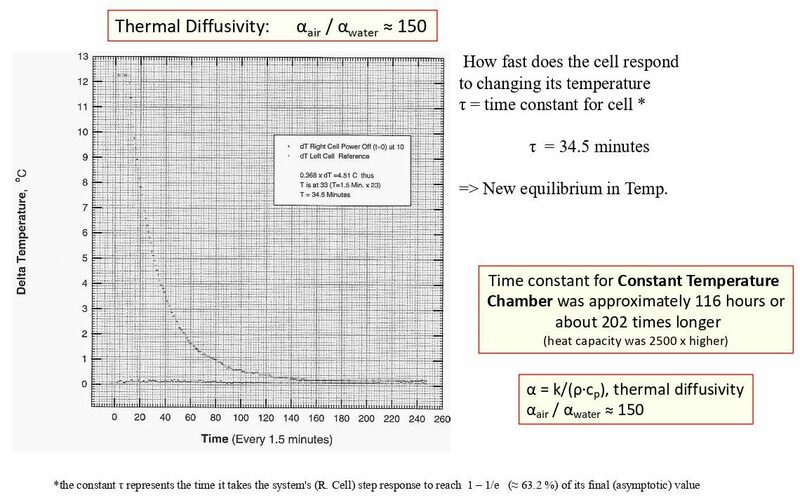 you need a low heat transfer 19:15 coefficient for the cell, so that you can 19:19 amplify the delta T signal, and the high 19:22 time 19:25 constant of the calorimetry chamber 19:27 needs to be much larger 19:29 than out of the cell. 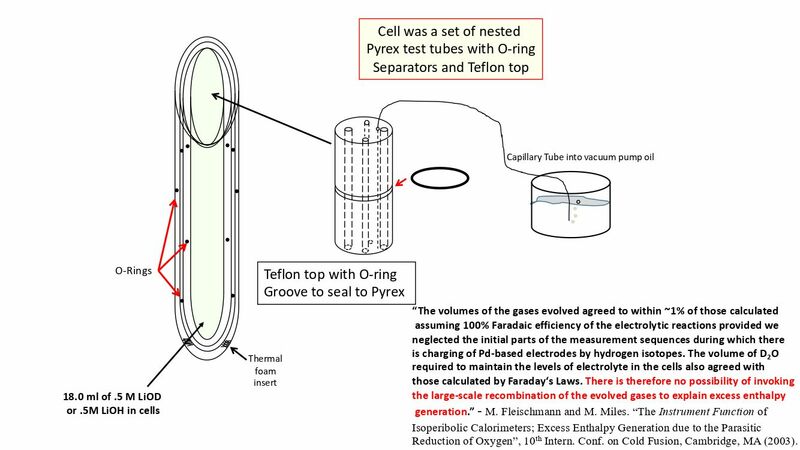 this is the cell 19:33 that my budget allowed for, which was 19:38 nesting test tubes to increase that 19:43 resistance to heat transfer out of the 19:46 cell, and sealing it with capillary tubes, 19:50 so that the gases came out through oil. 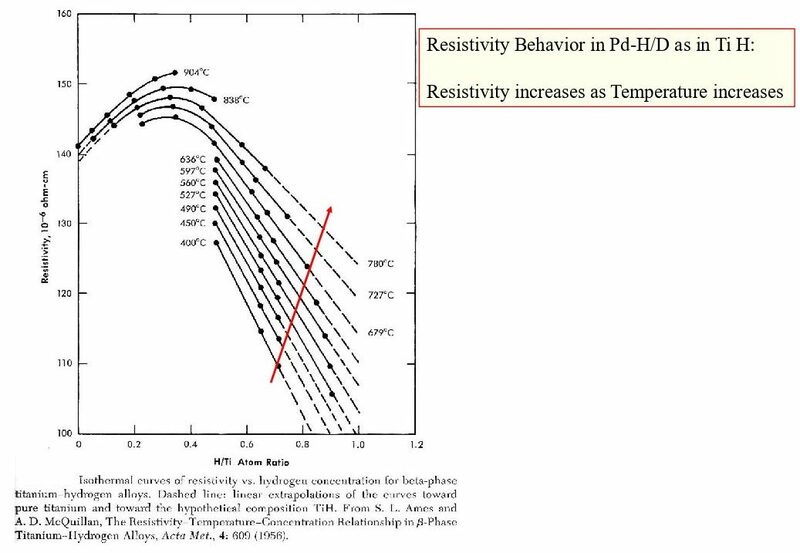 19:54 Fleischmann and Miles showed that the 19:58 recombination is not a source of heat. 20:01 and then after the SRI early 20:03 confirmations of excess heat in closed 20:06 systems, I felt confident using this 20:09 technique. 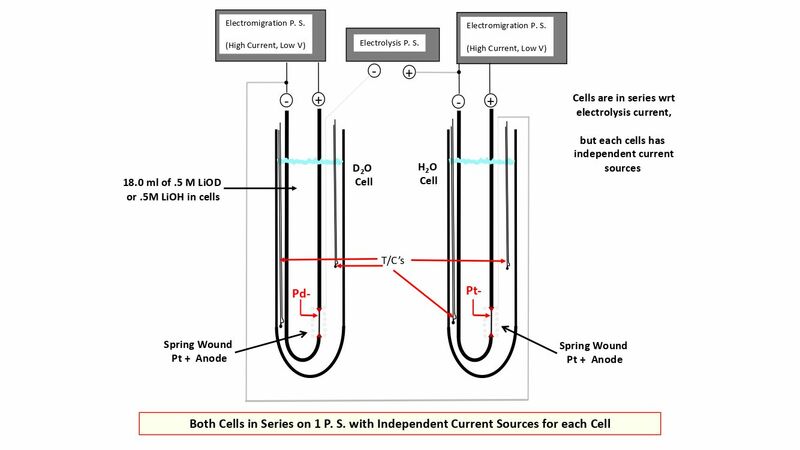 this shows our course along 20:16 the way of calibrating, and finding 20:19 ways of improving the the resistance to 20:23 heat transfer out of the cell. 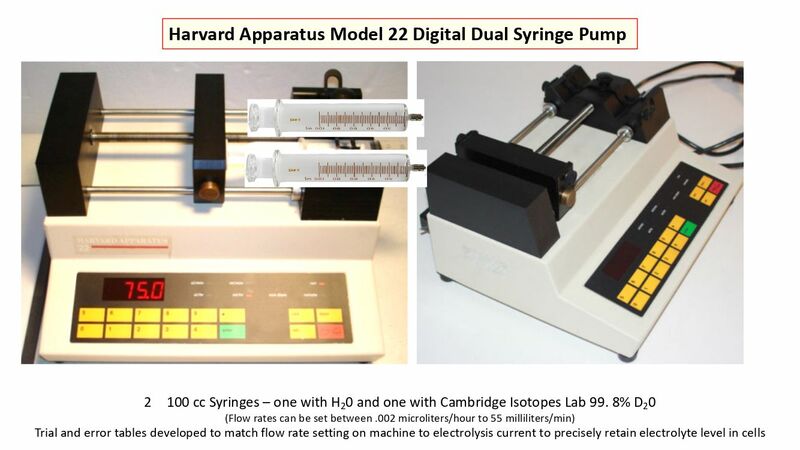 but the single 20:25 most important 20:27 experimental apparatus that allowed this 20:29 to work, was the syringe pump shown 20:34 here, which allowed control over the 20:37 insertion of the heavy water or the 20:39 light water in the cell, and allowed 20:42 for an approach to a quasi-steady state. 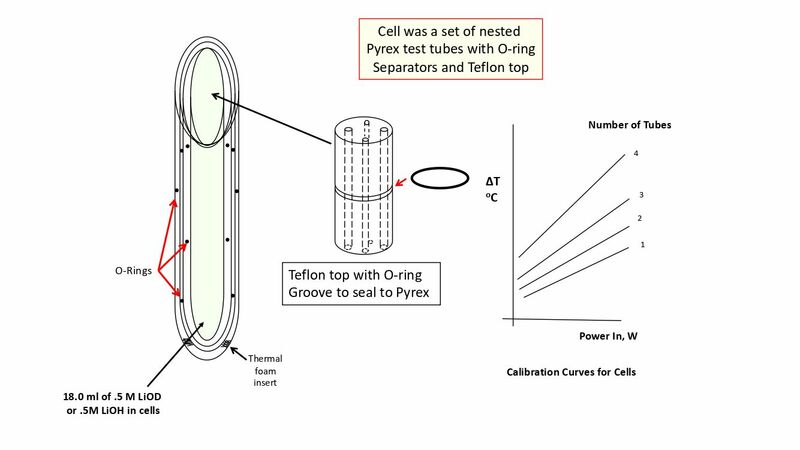 20:48 the actual calorimeter is shown here 20:51 which was a large 30 by 30 by 30 casing 20:55 of Benelex, two and a half inch thick, neutron 20:58 absorbing material, and the two 21:03 thermocouples inside the the cell were 21:06 averaged for the temperature of the cell, 21:08 and three thermocouples outside were 21:10 averaged for the temperature of the 21:12 media. now the interesting thing that I 21:14 discovered is that most people use water 21:16 for that media but I found that air is 21:19 actually better. 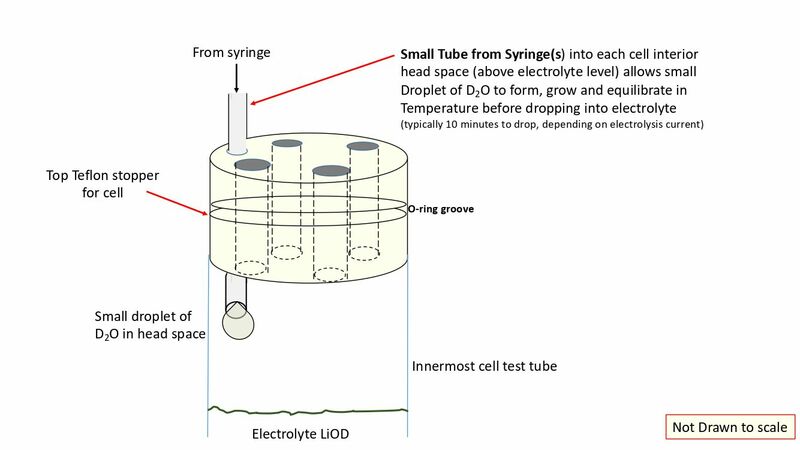 the syringe allowed 21:24 for a small capillary tube to hang a 21:28 drop of the d2o in the headspace, and allow 21:31 it to sit there and grow and thermally 21:35 equilibrate before it entered the 21:37 actual electrolyte so the electrolyte 21:39 never knew there was any incoming make-up 21:43 material. the time constant for the cell 21:47 was determined in the standard way of 34 21:50 minutes. that time constant was also 21:54 determined for the actual overall 21:55 chamber of 116 hours but that was 22:00 before I added about a ton of Benelex 22:04 shielding for neutron work ,which I spent 22:07 about two years on, which I am NOT going 22:10 to talk about, 22:10 you’re not going to coax me into talking 22:13 about it today. 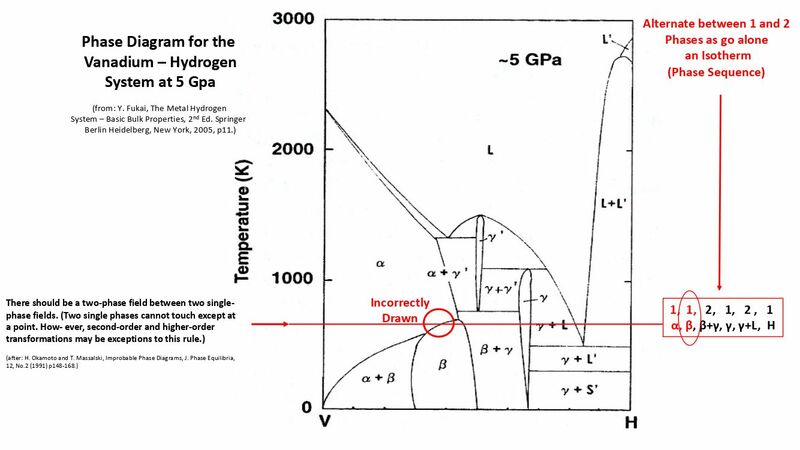 however, the thermal 22:19 diffusivity of air is 150 times that of 22:22 water, so when the heat comes out of the 22:24 cell it rapidly diffuses into the media, 22:28 away, more so than water and the only 22:31 problem with using air is, if there’s any 22:34 velocity currents in the air, they will 22:37 spoil the situation, so that’s why it 22:40 was encased in a large chamber, to 22:42 exclude any thermal currents in the room. 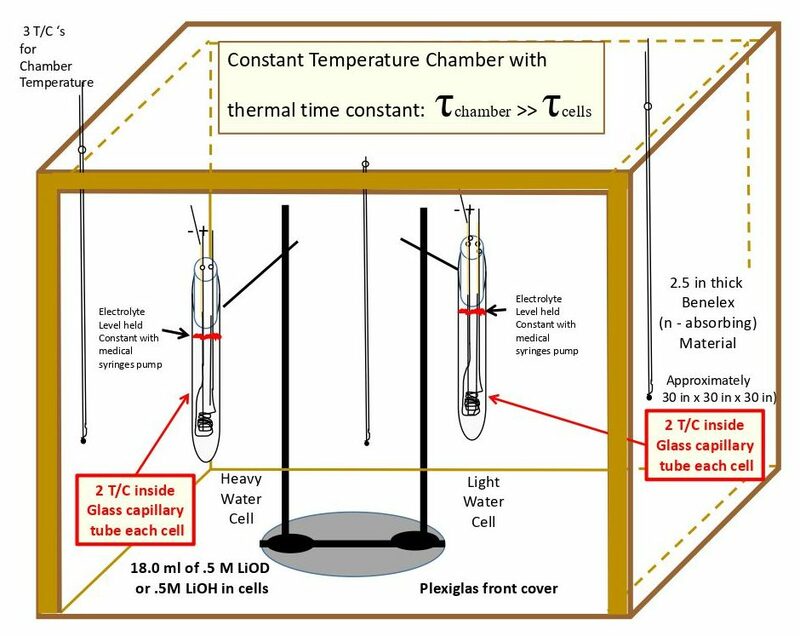 22:49 this is a hypothetical data set for the 22:53 difference in the inside of the cell to 22:55 the outside chamber, and this this would 22:59 never work. 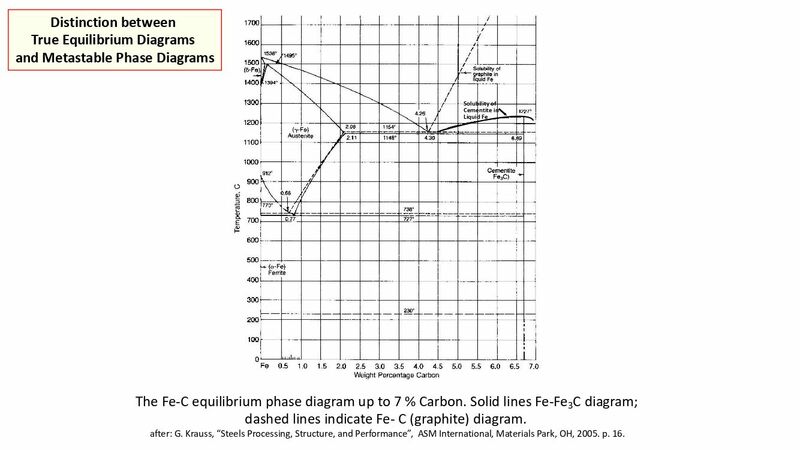 Slide 114 so 23:14 with further work, you can 23:17 improve the precision, you’re not 23:19 changing the accuracy, but you are 23:21 improving the precision, and giving 23:23 yourself confidence that if any data 23:26 point is off of this curve that it’s the 23:29 real thing. if you think this is good, 23:32 this is my data and this data is 23:36 not a line that I drew through the data. 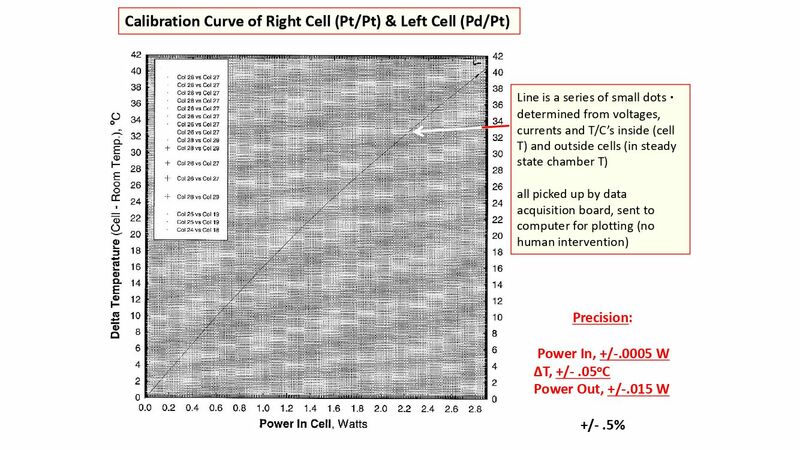 23:39 this is just a series of dots that were 23:43 taken by the data acquisition card, put 23:45 in an Excel file, and plotted 23:47 automatically on the curve and to get a 23:51 new data point you just move the 23:54 electrolysis 23:55 current up a little bit, or the 23:59 electromigration current up a little bit, 24:01 to a new set point, and let it come 24:03 to two steady state and acquire a new data 24:07 set. so you could move it every 15 or 20 24:11 minutes, 24:12 three or four times the time constant, 24:14 and get a new data set. so you just bump 24:18 this thing around, until we acquired all 24:20 the data that you see here, on the curve, 24:22 and I was delighted when I saw this. I 24:27 was ecstatic. 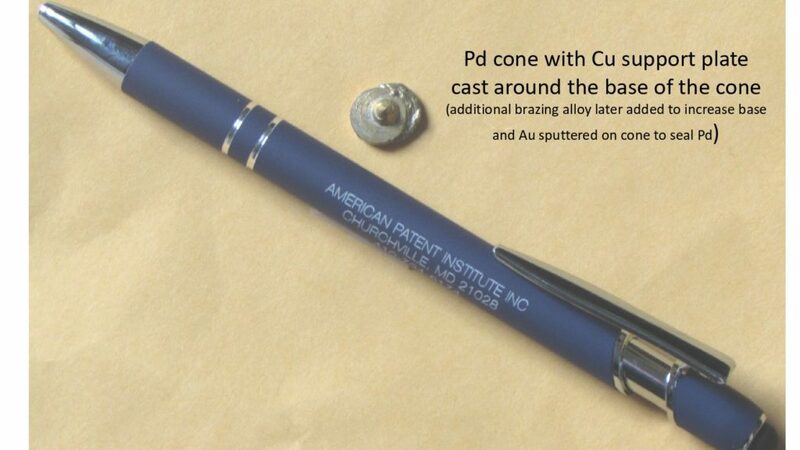 the precision in the power 24:31 could be measured to plus or minus a 24:35 half a milliwatt and the delta T to 24:38 0.05 degrees C, so the power 24:42 out had a plus or minus fifteen 24:45 milliwatt precision. 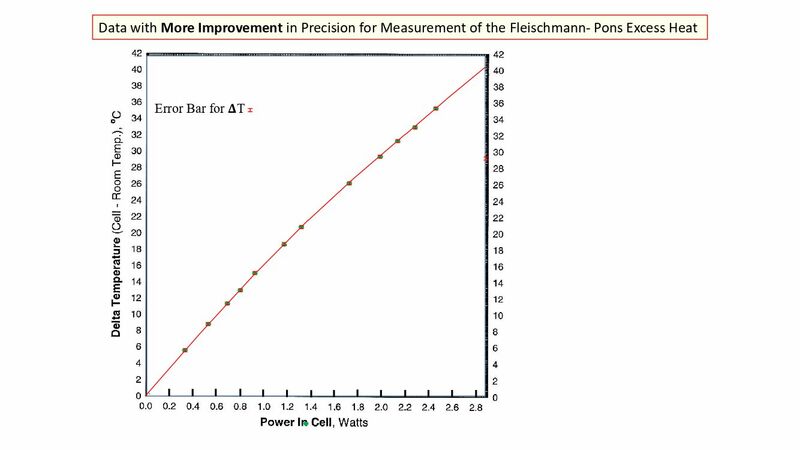 overall precision 24:50 for the experiment is a half a percent. 24:54 so the factors that enabled this are the 24:59 data acquisition, where I didn’t have to 25:01 take data by hand. there was no human 25:02 bias. [it] could gather thousand data 25:05 points a minute average them, and that 25:09 helped with the precision. enclosing the 25:12 the cell itself into an air sealed 25:15 chamber was really a key, but the 25:20 biggest and single most important one 25:22 was the use of the medical syringe which 25:25 allowed approach to steady-state. so the large 25:46 crosses here that you see were taken 25:50 after the experiment to confirm that 25:52 we’re still on the calibration curve. 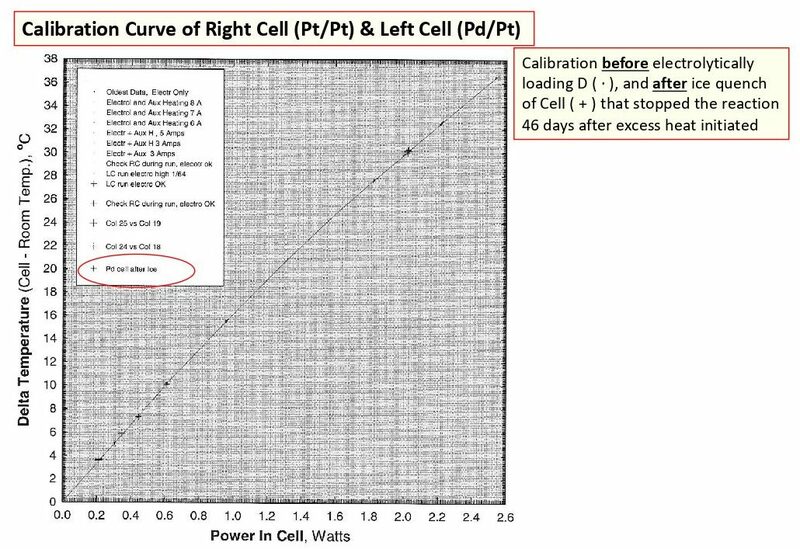 25:56 during the experiment the cells ran 25:59 higher than that calibration curve. 26:03 [unintelligible] 26:06 right here shown and then that is an 26:14 excess power of about 0.3 Watts. doesn’t 26:18 sound like a lot, but the specimen is 26:20 very very small. 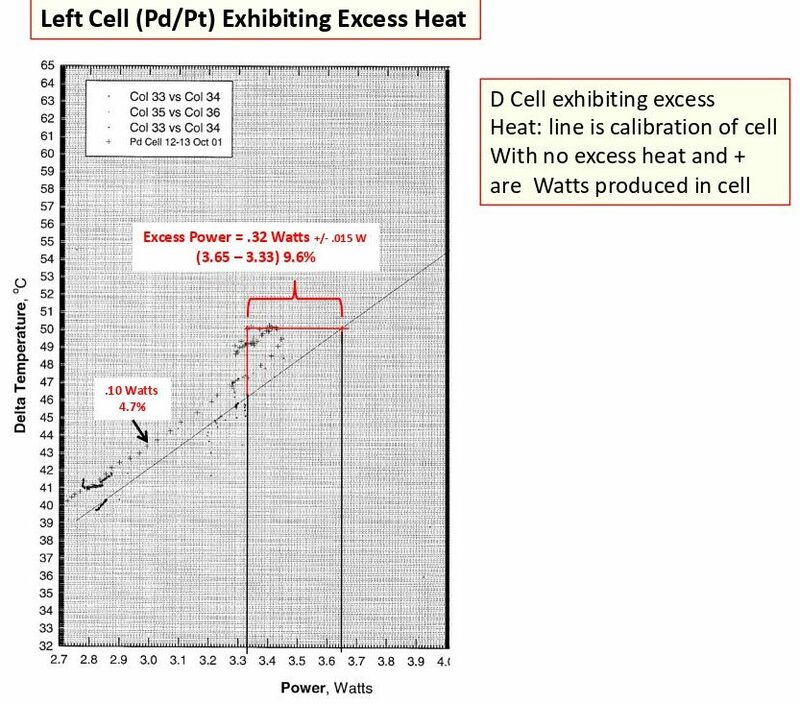 so that excess power did 26:24 change during the the 46 days that it 26:26 was produced, and some with only a tenth 26:30 of a watt is shown here. 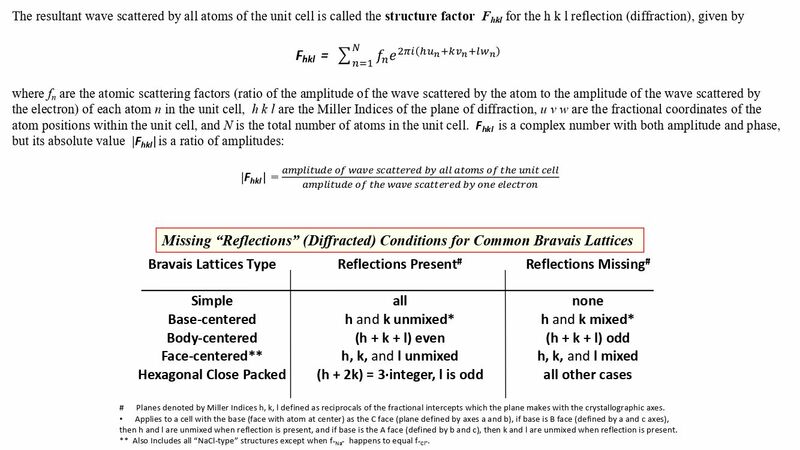 this is a 26:33 particular series of interesting events 26:36 where the lower is the light water cell, 26:40 which has all the same time constants 26:42 everything identical to the heavy water 26:45 cell so that we’re getting excess heat 26:48 at 440 milliamps of current density [sic] and 26:53 then it at this point was increased, the 27:00 total current, to 535 milliamps, 27:06 and the heavy water started into a 27:13 runaway mode, and I panicked and I turned 27:18 the electrolytic current 27:22 down to a little lower than what I had 27:24 before, and the excess heat came down, 27:27 and after a little while I said, “well 27:30 what would happen if I put it back to 27:32 where it was at 440: so I turned it back 27:35 to 442, and it went into another runaway 27:38 mode, wherein the excess power was double 27:44 what the input was. so for 2.4 watts out 27:49 I was only putting 1.2 watts in. 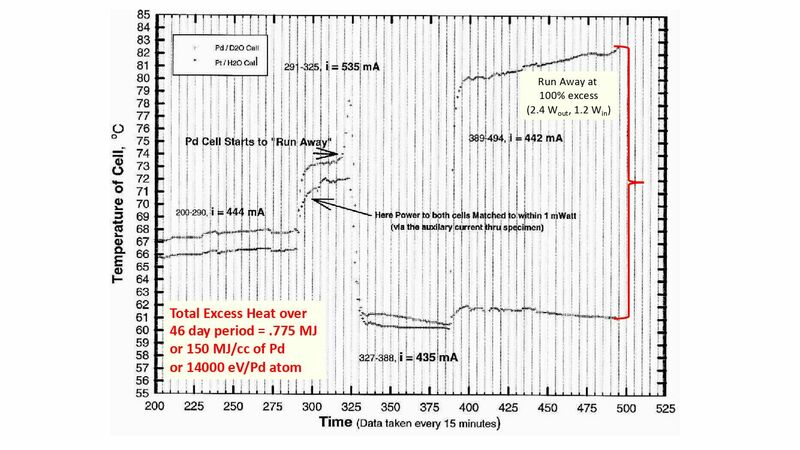 the 27:53 total excess heat for the 46 day period 27:55 was 0.775 megajoules or 150 megajoules 28:02 per cc of palladium. that calculates out 28:06 to 14,000 electron volts per atom, so 28:11 that number is high, because the specimen 28:14 was was so small. I’m gonna quickly go 28:19 through this, 28:21 I have to get to the end. 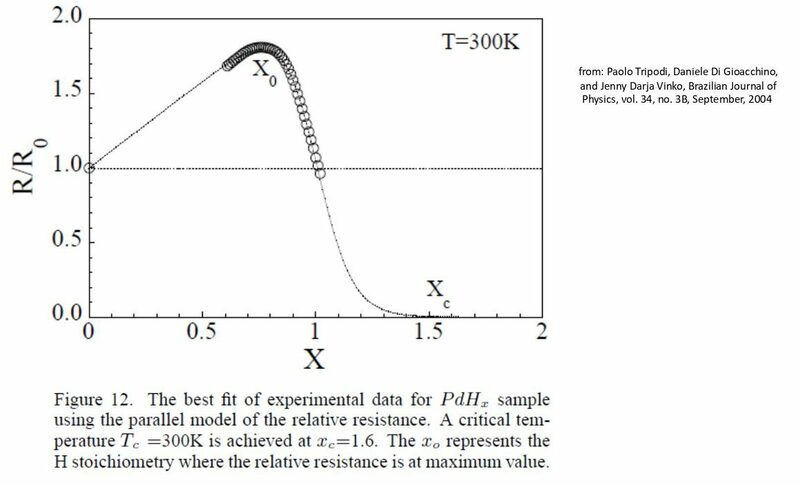 this 28:26 is a drop in the the resistance during 28:30 the experiment and it’s 28:35 unlikely that this drop in resistance is 28:37 due to loading because the current 28:41 density was constant. and — no the current 28:45 density here was was increased — which I 28:50 believe triggered the Deltaprime 28:53 phase. 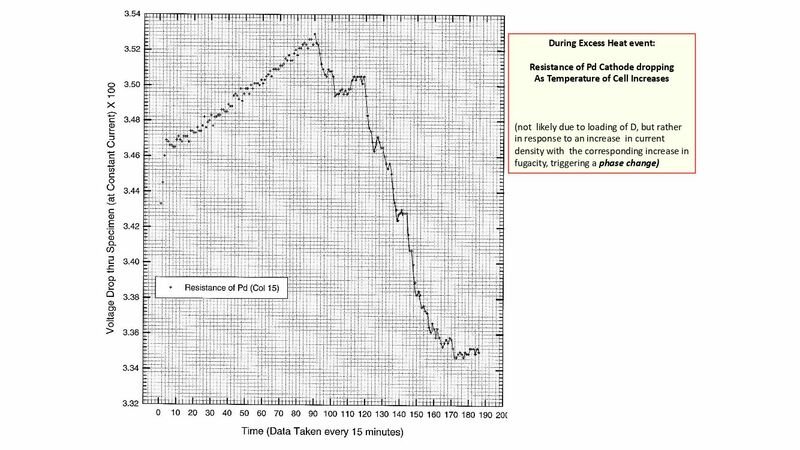 solubility decreases with 28:57 increasing temperature so that’s another 29:00 reason why it’s unlikely. 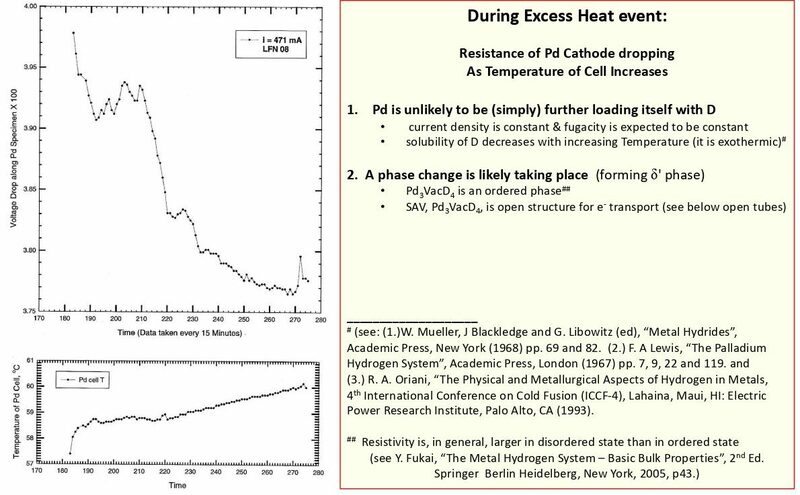 the temperature on the 29:14 lower scale was rising, whereas the 29:16 resistance is dropping, so palladium is 29:20 unlikely to be just simply loading 29:23 itself, and a phase change is likely that 29:27 is the Pd3 Vac4 [sic, Pd3VD4] going to 29:32 the Pd3Vac4 [sic, Pd3VD4] in the 29:34 tetrahedral sites. 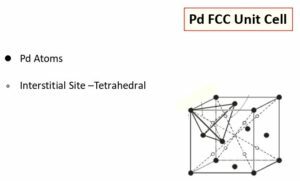 Slide 134 the palladium unit 29:39 cell with [deuterium] either occupying the the 29:43 tetrahedral or the octahedral sites. 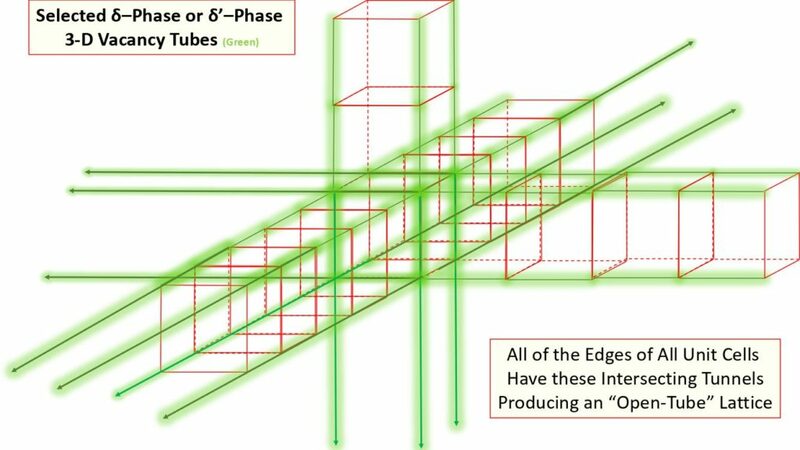 and 30:05 if you extend those cells in three 30:08 dimensions, you’re going to see that 30:11 there are extensive pathways for open 30:16 tube lattice structure, where there are 30:18 no atoms whatsoever except perhaps 30:20 hydrogen. sorry I’ll put it in the paper, and I do 30:32 apologize. I thought I could get to the 30:34 end. [applause.] The following slides remained in the deck to be shown. In addition, the slides document contains extraneous slides that appear to be accidentally included, not shown here. This is a list of slides provided so that one may refer in discussions elsewhere to slides. Each slide above has a small label at the top. These links will jump to that label. 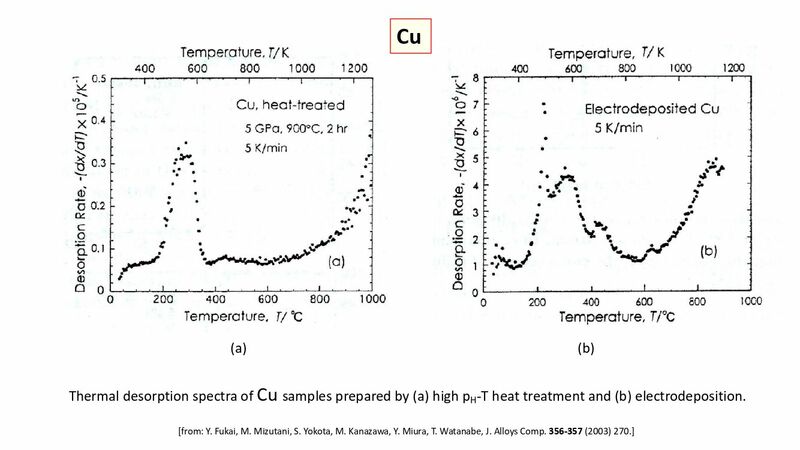 Slide6 Thermal desorption spectra, Cu samples, prepared by high pH-T & electrodeposition. 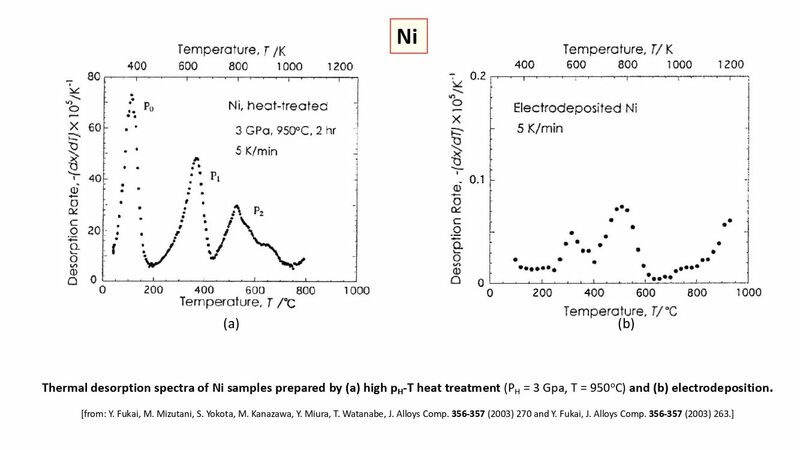 Slide7 Thermal desorption spectra, Ni samples, prepared by high pH-T & electrodeposition.